From his foreword to "Croatia in the Middle Ages: A Cultural Survey"
It is described in a monograph of the famous Danish architect and archeologist Ejnar Dyggve, "History of Salonitian Christianity", Oslo, 1951 (Croatian edition by Knjizevni krug, Split, 1996). and the Arena in Pula (1st century, 6ht largest in the world, 23,000 seats). 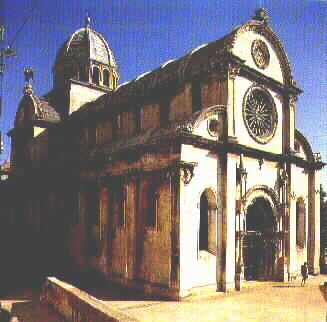 Very important remain of Byzantine art in Croatia is the Euphrasius Basilica in Porec, built in the 6th century. 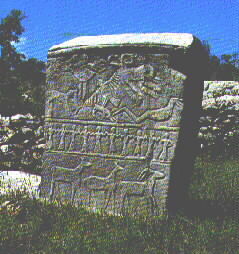 There are numerous traces of much older civilizations throughout Croatia. Especially interesting is the Vucedol Culture (Early Bronze Age, 3000-2200 B.C. ), discovered in the region near Vukovar, contemporary to the Ancient Egypt (the Old Kingdom), the Sumerian civilization, the Old Troy. On the photo you can see the famous Vucedol Dove, a bird-shaped cult vessel, lavishly incrusted. From ornaments of some pots we know that the Vucedol culture had the oldest calendar in Europe, older (though less sophisticated) than the one in Stonehenge. See [Durman]. 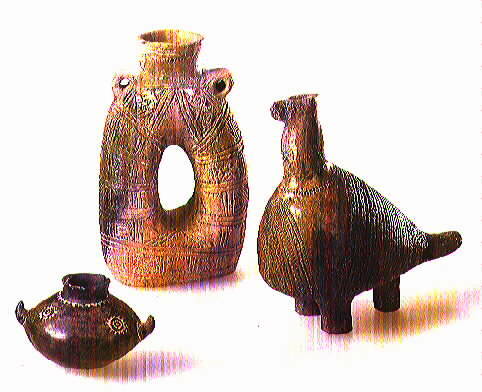 Numerous artifacts of the Vucedol culture (including some of the most valuable) have been robbed during the Greater Serbian aggression on Croatia in 1991. This important Croatian cultural heritage is still in Yugoslavia. REMARK. 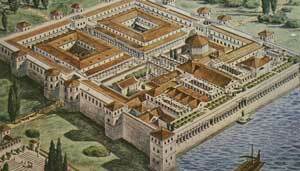 The Netscape virtual tutorial offers several examples of some of the most beautiful web-pages, including an excellent presentation of the Diocletian palace in Split by Michael Greenhalgh from the Australian National University, Canberra. Unfortunately, I was not able to convince the author of this exceptional web-page that it would be more convenient to note that the state in which the city of Split lies is Croatia (Croatized already in the 9th century, a part of the Croatian state in the 10th century, during the King Tomislav), rather than ex-Yugoslavia (which was also true, but only for 68 years!). An important monograph describing Diocletian's Palace in Split is "Ruins of the Palace of the Emperor Diocletian at Spalatro in Dalmatia" written by Robert Adam in 1764, with his main associate Ch.L. Clerisseau. The author, an outstanding Scottish architect, mentions the beauty of Split and its favorable position and climate, stating that ``in the whole of the wide Roman Empire, not a single region could offer Diocletian a more marvelous place to withdraw to for a life of peace''. He designed several buildings in the style of Diocletian's palace (Syon House in Middlesex, Kedleston in Derbyshire, Adelphy Palace in London). 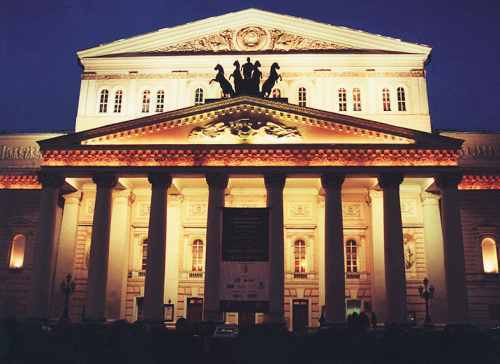 Influences of his book can be seen even in St. Petersburg in Russia and in Virginia in the USA. The octagonal Mausoleum of the Roman Emperor Diocletian was transformed into the Christian church of St Dominius (Dujam) already in the 7th century, representing very probably the oldest cathedral in the world. 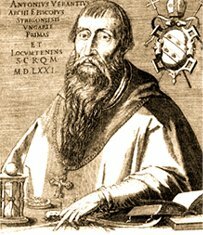 According to Danish scientist Ejnar Dyggve, St Dominius (Dujam), the earliest known bishop of Salona (4th century), originated from Syria or Mesopotamia. Local Split tradition also confirms this. It is little known that the founder of the Republic of San Marino is St. Marinus, stone-carver born on the beautiful island of Rab in the 3rd century. Being a Christian, he had to escape to Rimini with his boat due to Roman persecutions of Christians during Diocletian's time. 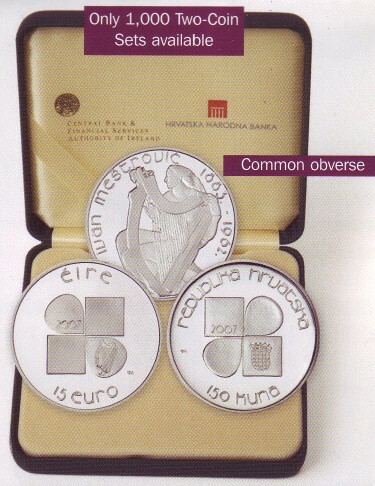 San Marino and the Rab are fraternal towns. Every year a joint festival is held alternately in Rab and San Marino. 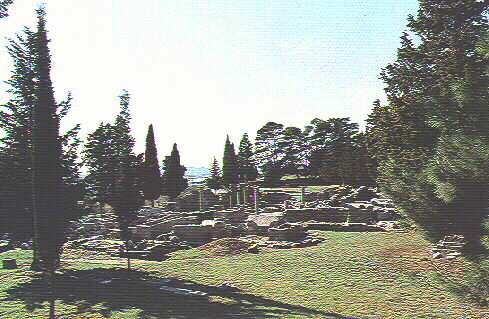 Another important archeological site is Bribirska glavica near the town of Skradin, where Croatian dignitaries Subic-Bribirski (later known as Subic-Zrinski) had their seat. The place is near the town of Skradin. First archeological excavations were undertaken by fra Lujo Marun, and then Stjepan Gunjaca. Settled already by Illyrians, during early Roman times it was called Varvaria, and had the status of municipium. 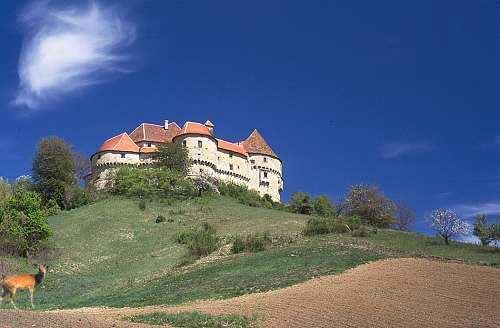 In 14th century it was important fortress during the reign of Pavao Subic, Croatian Ban (governor) and ruler of Bosnia. In the period of 1991-1995 Greater Serbian aggression, this outstanding place has been used for bombing and shelling of Croatian towns and villages, and left completely devastated. It was liberated during the Storm operation in 1995. The beginnings of the Croatian art are represented by a rich ornamentation in interlace pattern. You can see an important monument with the interlace pattern which contains the name of Duke Branimir (9th century). 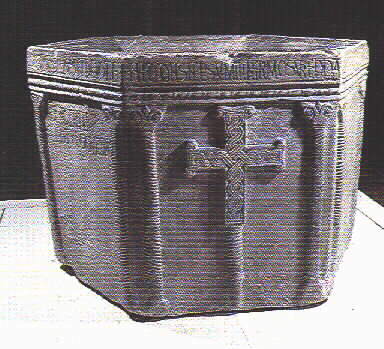 One of the earliest Croatian cultural monuments is a baptismal font of Prince Viseslav from Nin (around 800 AD), with a nice interlace cross. It contains the following Latin text, full of interesting ligatures: HEC FONS NEMPE SUMIT INFIRMOS, UT REDDAT ILLUMINATOS. HIC EXPIANT SCELERA SUA, QUOD DE PRIMO SUMPSERUNT PARENTE, UT EFFICIANTUR CHRISTICOLE SALUBRITER CONFITENDO TRINUM PERHENNE. HOC IOHANNES PRESBITER SUB TEMPORE VUISSISCLAVO DUCI OPUS BENE COMPOSUIT DEVOTE, IN HONORE VIDELICET SANCTI IOHANNIS BAPTISTE, UT INTERCEDAT PRO EO CLIENTULOQUE SUO. Croatian translation: Ovaj izvor naime prima slabe, da ih učini prosvijetljenima. Ovdje se peru od svojih zločina sto su ih primili od svog prvog roditelja, da postanu kršćani spasonosno ispovijedajući vječno Trojstvo. Ovo djelo pobožno učini svećenik Ivan u vrijeme kneza Višeslava, i to u čast sv. Ivana Krstitelja, da zagovara njega i njegova štićenika. 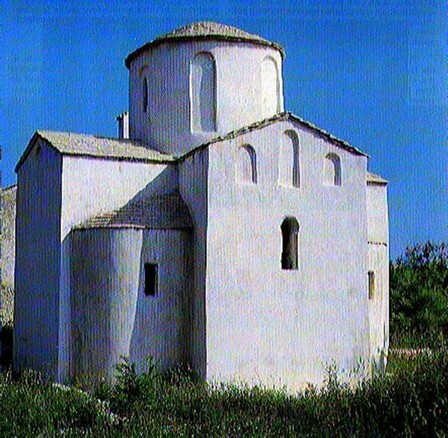 A special importance have about 150 Pre-Romanesque Croatian churches (9th to 11th century), mostly along the coast. About 15 of them are well preserved (some of them completely destroyed during the Greater Serbian aggression in 1991-1995). Probably the best example of old Croatian church architecture is the Pre-Romanesque Chapel of Holy Cross in Nin built around 800 AD (Sveti Kriz; see on the right; on the left is the small church of Sveti Nikola). The British architect Thomas Graham Jackson called it in 1887 the smallest cathedral in the Christianity, because of its monumental architectural conception. An unofficial estimate claims there are about 10,000 fragments of interlace sculpture scattered all over Croatia, see [Goss], p. 32. 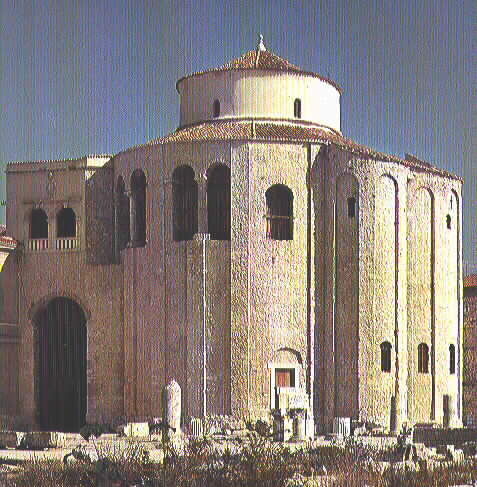 One of the most important monuments of the Pre-Romanesque architecture in Europe is the Church of St. Donat in Zadar built in the 9th century. According to [Goss, p 92], a discovery of wooden beams in this monumental church, adorned with interlace, datable by carbon method to around 710, indicates that this building, often referred to as "Carolingian", was well-under construction in the course of eighth century. Truly fantastic stone monuments with interlace patterns were found in Dubrovnik and its environs, see [Menalo]. 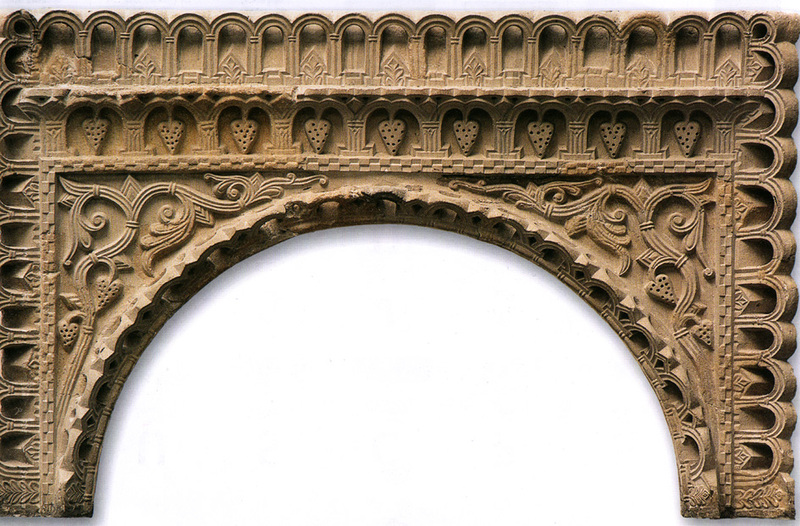 See also another Croatian interlace in the cathedral of St. Tripun of Kotor in Boka kotorska. written in the Croatian Cyrillic alphabet. 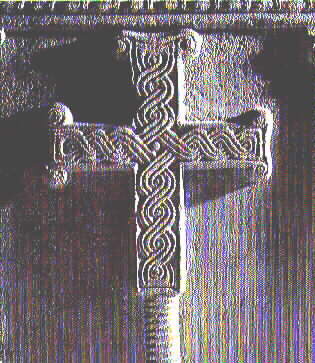 The most widespread ornaments are Christian symbols. richly ornamented Zgosca stechak (15th century? ), held in the Sarajevo Archeological Museum. A few more examples are here. The first documents of the Croatian Cyrillic alphabet are inscriptions carved in stone in present-day Bosnia-Herzegovina dating from the 10th or 11th century (Humacka ploca) and on the Croatian island of Brac from the 12th century. 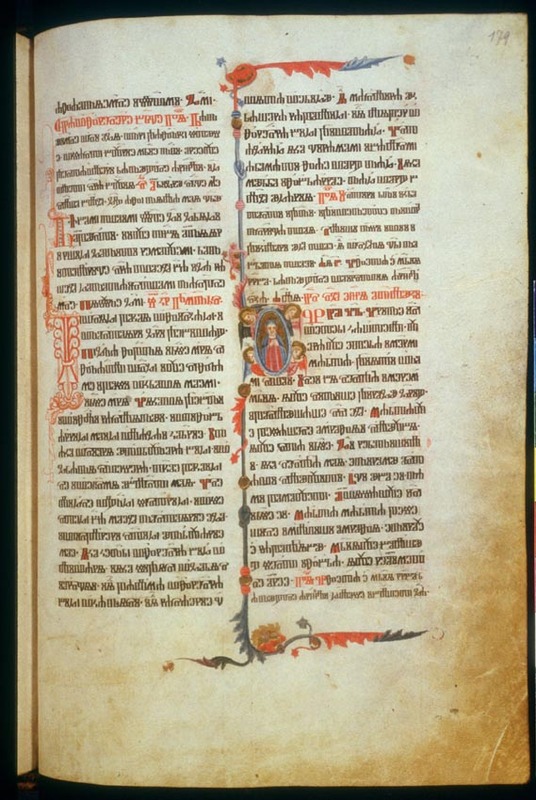 They also contain some glagolitic letters. 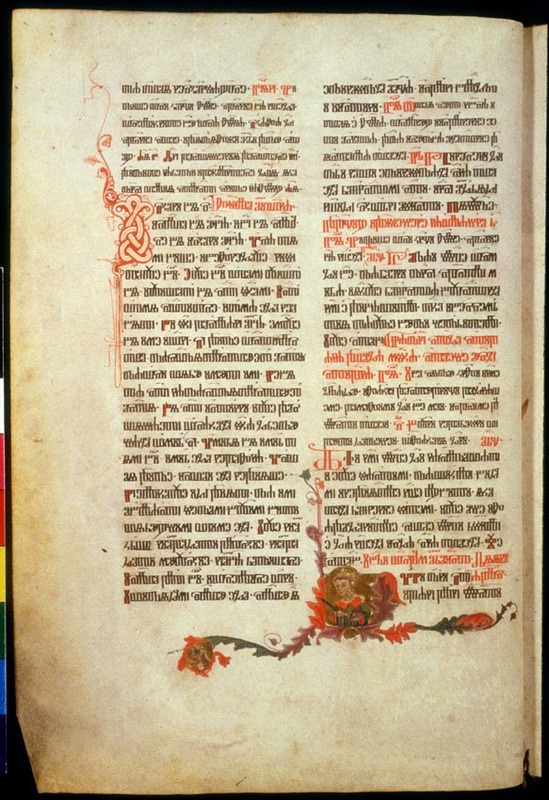 Many written documents concerning medieval Croatia contain simultaneously three Scripts, thus proving their unexclusiveness and coexistence, which is unique in the history of European culture. For example some of the religious texts end with `Amen' written three times: in the Glagolitic, Cyrillic and Latin script. 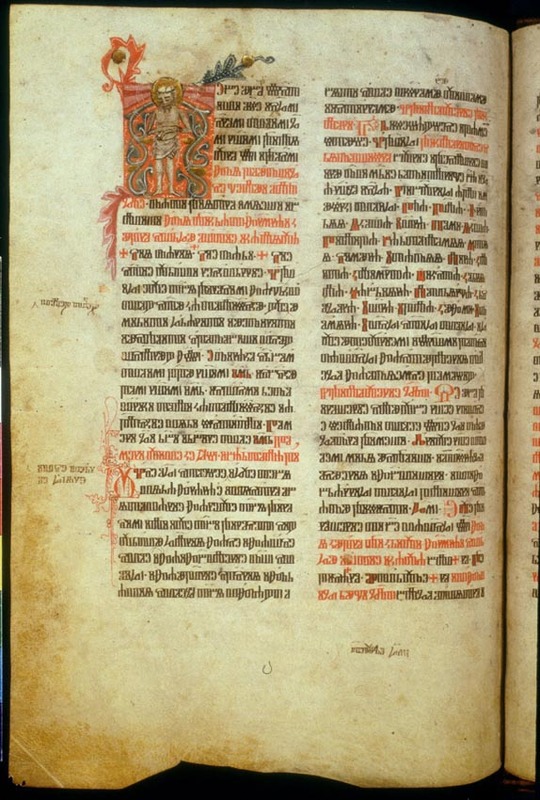 Apart from the parallel use of the three Scripts, unique is also the simultaneous use of three languages - Croatian, Latin and Church Slavonic. Among the best artists of his time was the Croatian sculptor Radovan (born in Trogir, 13th century), who left us the beautiful Romanesque portal on the Cathedral of Trogir. The wooden portal on the Cathedral of Sv. 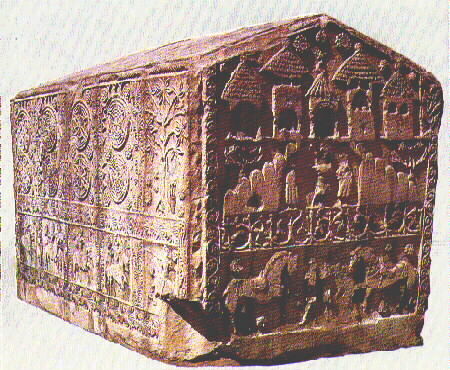 Dujam in Split carved by Andrija Buvina in c. 1214 is world famous. It is ranked among the most beautiful pieces of art in the medieval Europe. 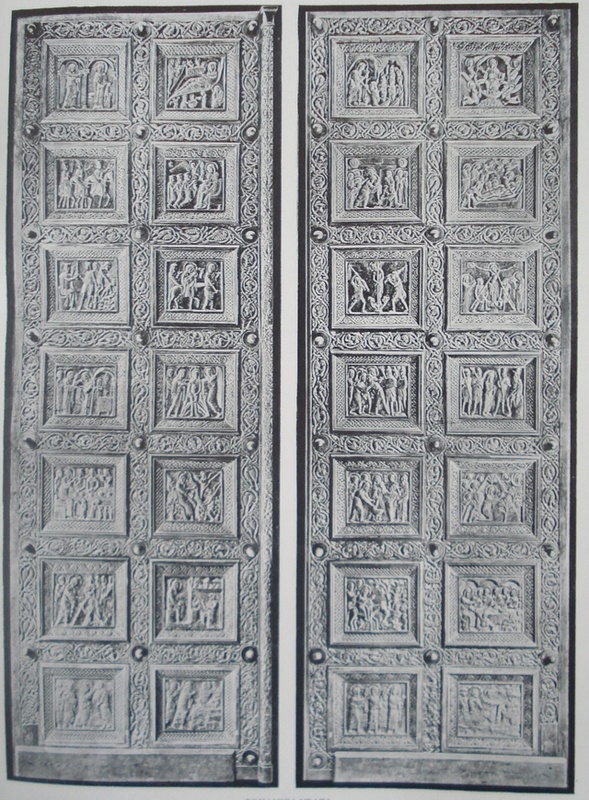 The height of the Buvina door is 5.3 m. It contains 28 scenes from the life of Jesus Christ. Photo from Croatian Encyclopaedia, Zagreb 1941. Another famous Croat was Juraj Dalmatinac (Georgius Mattei Dalmaticus, known as Giorgio Orsini in Italy, 15th century, born in Zadar) who built the Loggia dei Mercanti and the portal of St. Francis Church in Ancona. His epoch represents the golden age of Croatian medieval art. His most beautiful achievement is the Cathedral of St. Jacob (Jakov) in Sibenik, the top monument of Croatian culture, reflecting in a sense the character of urban life of that time, and certainly a sculptural chef d'oeuvre (shelled during the Greater Serbian aggression in 1991). The entire building is composed solely of stone elements (no wood or bricks). Especially interesting are 74 portraits of his fellow-citizens carved in stone, surprisingly realistic for that time. 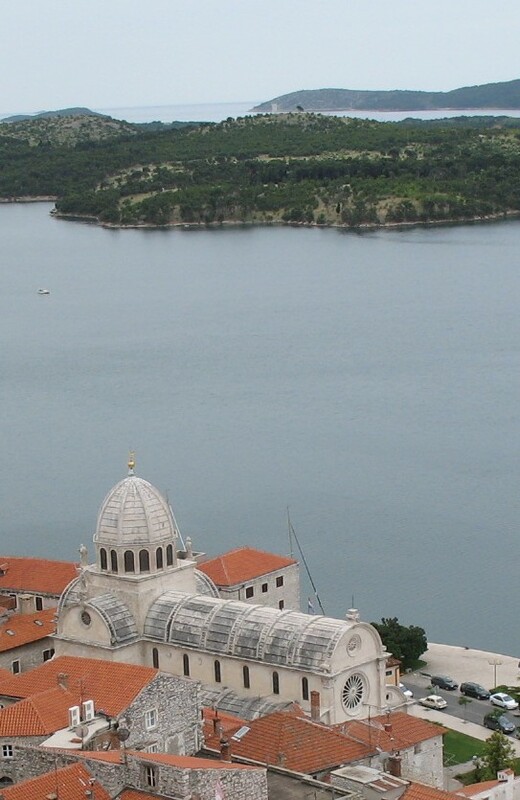 It should be noted that the city of Sibenik was built in the time of King Kresimir IV (11th century). 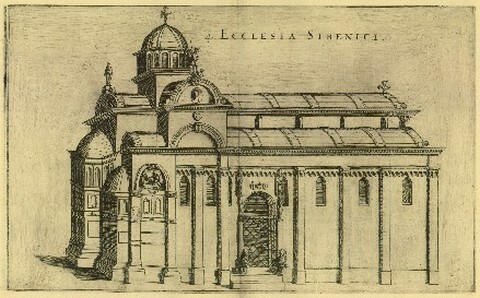 Here is is a drawing of Sibenik's Cathedral appearing in Faust Vrancic's famous book Machinae Novae (Venice, 1595). In the Istrian peninsula you can see lovely lovely churches beautifully decorated by Vincent of Kastav (15th century). Especially interesting are his frescos in the solitary church of St. Maria near Beram. 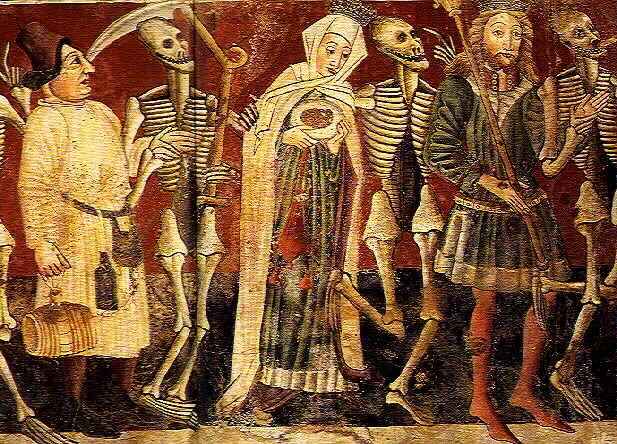 On the photo you can see Vincent's ``Dance of Death'', a fresco showing the equality of all in death. Another Istrian painter whose frescos can be seen in Istria, including its Slovenian part, is Ivan of Kastav. For some reason Slovenians prefer to call him Janez, which is Slovenian equivalent for Ivan. By the beauty of small medieval towns and its landscape, Istria is unique in Europe. Let us mention here, as a part of musical folklore, the famous Istrian scale. Istria is, together with our greatest island Krk, also the cradle of the Croatian Glagolitic Script. James Joyce, Irish writer and Nobel prize winner, spent six months in 1903/1904 teaching English in the town of Pula in Istria, together with his future wife. 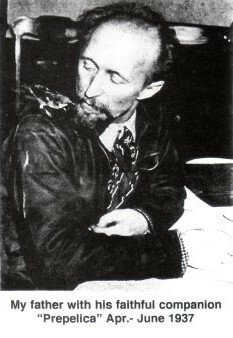 Joules Verne placed the story of his novel "Mathias Sandorf" in the town of Pazin in central Istria, and in the Pazin cave. The first Naval museum in the world was founded in Pula in 1870. 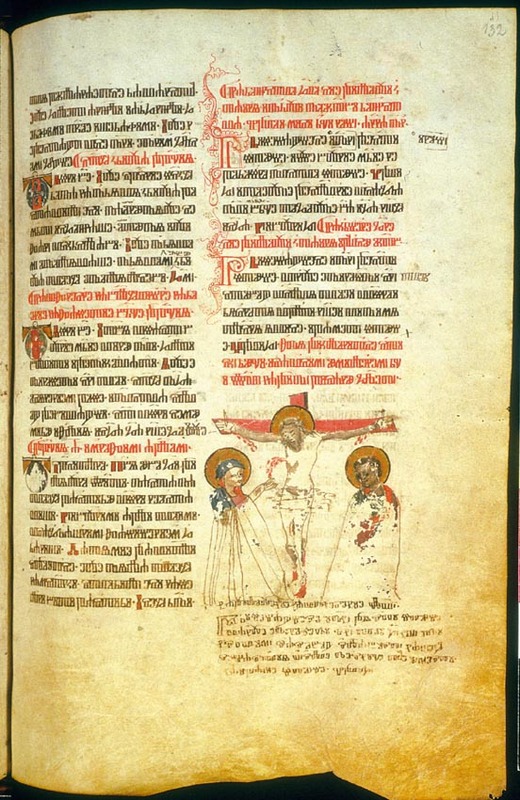 The Hrvoje missal, written by Butko in 1404, is kept in the Library of Turkish sultans Topkapi Sarayi in Constantinople, Turkey. 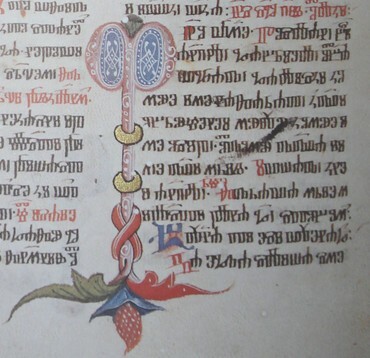 It is considered as one of the most beautiful Croatian Glagolitic books. Note a small strawbery below. Yellow details are made of golden leaves. 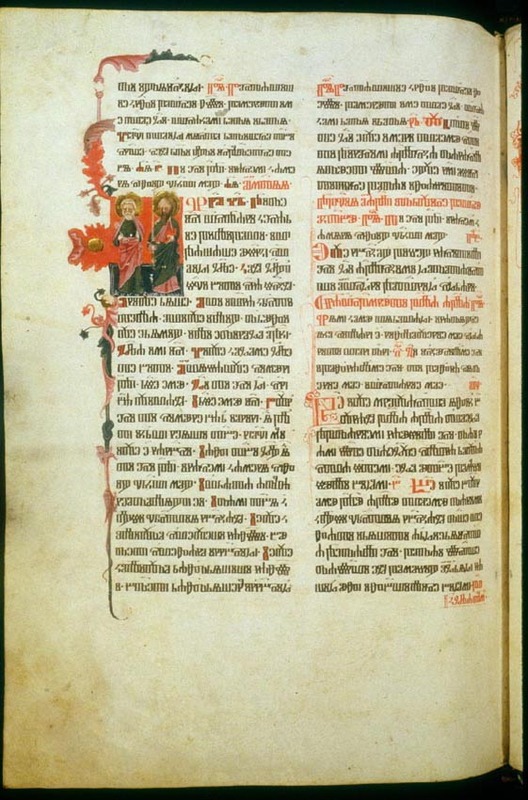 in the National and University Library of Ljubljana (Beram Missal, around 1425), and in Zagreb. He considerably influenced the development of Renaissance architecture. 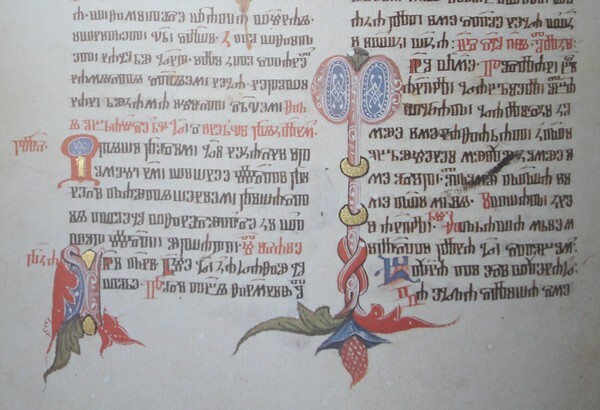 His projects were accompanied with notes in the Croatian glagolitic script, as witnessed by the famous Bernardo Baldi. Frano Laurana, known also as Francesco Laureano (1420 - 1502), a Croat born near Zadar, was a sculptor in Italy (Naples, Messina, Palermo) and in France (Aix, Marseille, Avignon, Le Mans, Tarascon). In France (Provence) he worked at the Court of Bon Roi René, and married a daughter of a French painter in Avignon. His portrait busts of women represent the highest achievement of the Quatroccento sculpture. They can be seen in galleries in Palermo, Vienna, New York and Paris (Louvre, Musée Jacquemart - André). His disciple was the famous Donato Bramante. See [Gregory Peroche], p. 72. In the Musée du Louvre in Paris (l'aile Déon) dedicated to Italian sculpture of Quattrocento, two Croatian artists are represented, Francesko Laurana and Giovanni Dalmata de Trau (Ivan Duknovic from Trogir). Their 4 sculptures and bas-reliefs can be seen in the first hall. It is interesting that Renaissance art appeared in Croatia about a hundred years earlier than in France. See information about the exhibition La Renaissance en Croatie at Musée national de la Renaissance in Paris in 2004. Ivan Duknovic (15/16th centuries), together with Mimo de Fiealo, constructed the grave of Pope Paul II, which is regarded as the most important sculptural work of the 15th century in Rome (Duknovic made the portrait of the Pope, alegorical presentation of Hope, etc.). 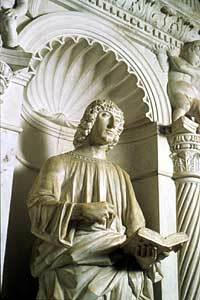 Juraj (Giorgio) Spavento was an important 15th century builder in Venice, whom chronicler Marin Sanuto called homo di grande inzegno. He was a protomaster in construction of the Venetian bell-tower of basilica of St Marco. He participated in building of monumental Scale dei Giganti in Ducal Palace, and was involved in questions of regulation of a canal around Ponte dei Navi in Venetian arsenal. Italian historiography seems to be reluctant to stress that his birthplace was the city of Trogir. Sacral paintings of Blaz Jurjev Trogiranin (known as Blasius Pictor, ~1412 - 1448) are held not only in various churches in Croatia - in Zadar, Sibenik, Trogir, Kastel, Split, Korcula, Ston, Dubrovnik, but also abroad - in the People's Museum in Budapest, Museo Correo in Venice, People's Gallery in Warszaw, Luxemburg. He was fluent in the glagolitic script, which we know from his short note on the polyptych prepared for the church of St. Lovro in Trogir. 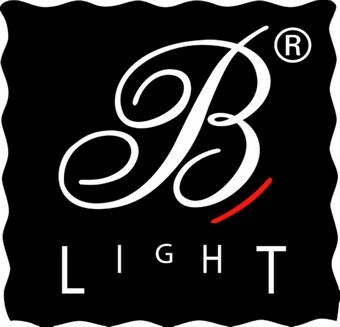 Blaz was born in the Croatian region of Lika. Professor Miklos Boscovits, art historian from the University of Florence, Italy, contributed much to our knowledge of Blasius' works of art kept outside of Croatia. Juraj Culinovic (1435-1504), Croatian Renaissance painter, was active in his native town of Sibenik. 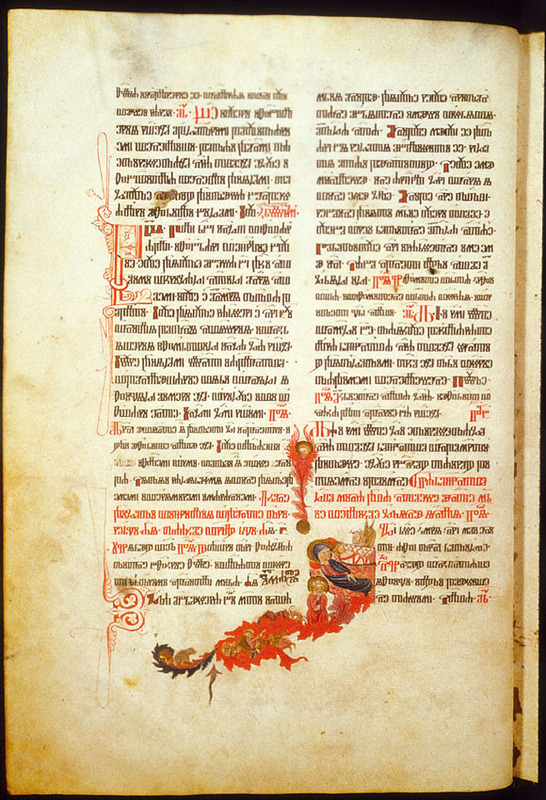 Except in Croatia, his polyptichs are kept also in Torino, London (National Library), Berlin and Venice. Feliks Petancic was the last head-master of the famous scriptorium in Buda (part of today's Budapest) until the death of Matija Korvin in 1490. He was a Croat born in Dubrovnik around 1455, and he died after 1517. 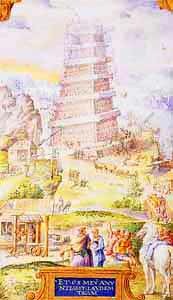 He entered the history as a scribe and a painter. 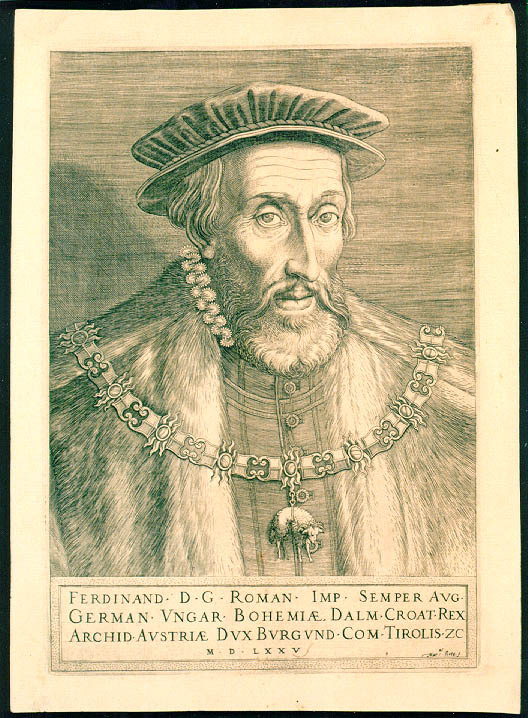 As a miniaturist he portrayed many Turkish sultans and high court officials in his parchment rotulus called Genealogia Turcorum Imperatorum (started in 1502). 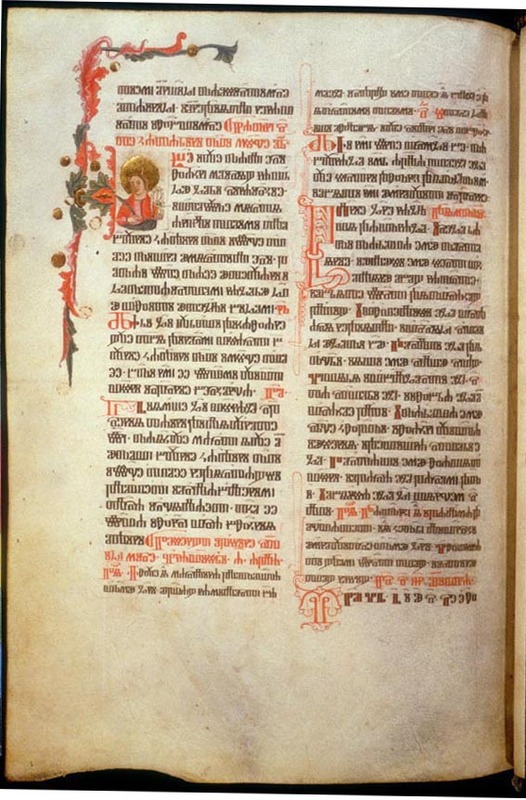 His another work is Historia Imperatorum regni Turcici (1502) that is held in the municipal library of Nürnberg in Germany. This book represents the first history of Turkish Empire written in Europe. 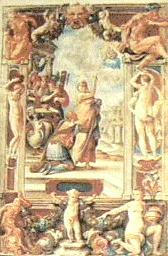 Petancic's masterpieces belong to highest achievements of Central European Renaissance miniature. The famous German painter Albrecht Dürer (1471-1528) left us a very nice drawing from 1528 representing coats of arms of Dalmatia and Croatia. See [Gregory Peroche], p. 270. Julije Klovic, or Don Giulio Clovio de Croatia (1498-1578), is regarded as the last great representative of the classical European miniature. His works decorate many famous galleries: Uffizi in Florence, Museo di Capodimonte in Naples, Biblioteca Marciana in Venice, Galleria Sabanda in Torino, Bibliothek der Albertina in Vienna, Louvre in Paris, Towneley Public Library and Pierpont Morgan Library in New York (which is in possession of "Officium Virginis", 228 pages, his most famous and the best masterpiece, containing 30 valuable miniatures by his hand), the British Museum and Soane's Museum in London, Windsor Castle (Royal Library), Library of the John Rylands University in Manchester. 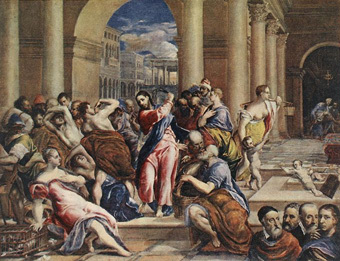 His pupil was El Greco, who portrayed him in his work "Expelling merchants from the temple" (together with figures of Rafael, Michelangelo and Tizian, appearing on the bottom left of that work), now kept in The Minneapolis Institute of Arts (The Willam Hood Dunwoody Fund). His grave is situated near Michelangelo's Moses in the the church of S. Pietro in Vincoli, Rome, and bears an inscription "Pictor de Croatia". 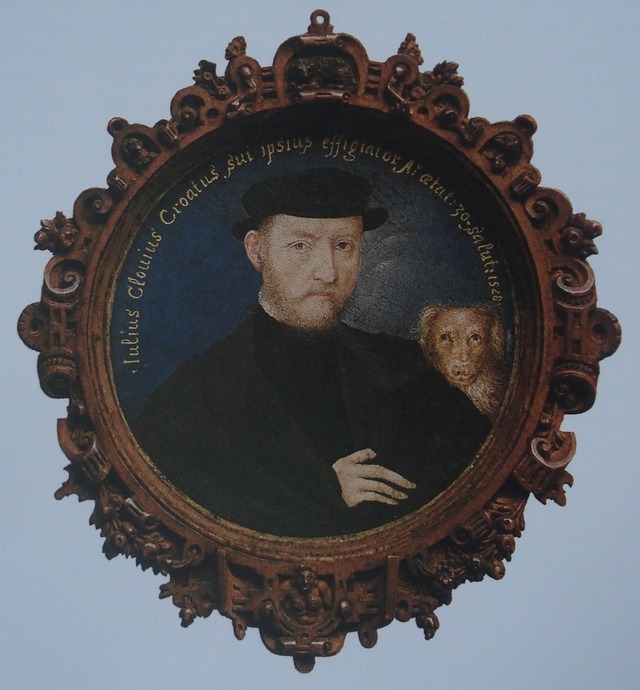 Selfportrait of young Julije Klović from 1528, kept in Kunsthistorisches Museum in Vienna. Iulius Clouius Croatus sui ipsius effigiator Ao:aetat: 30.salut: 1528. Iulius Clouius [sic!] sui ipsius effigiator Ao:aetat: 30.salut: 1528. 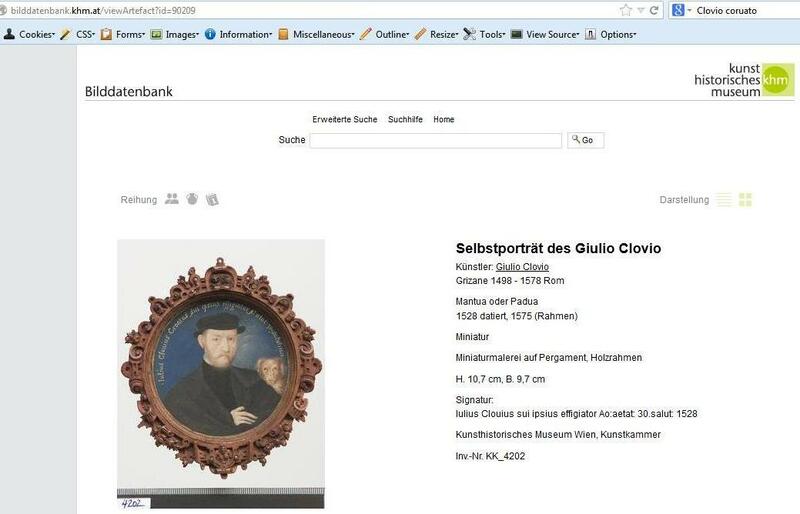 i.e., Croatus has been omitted on the web page of the Kunsthistorisches Museum. 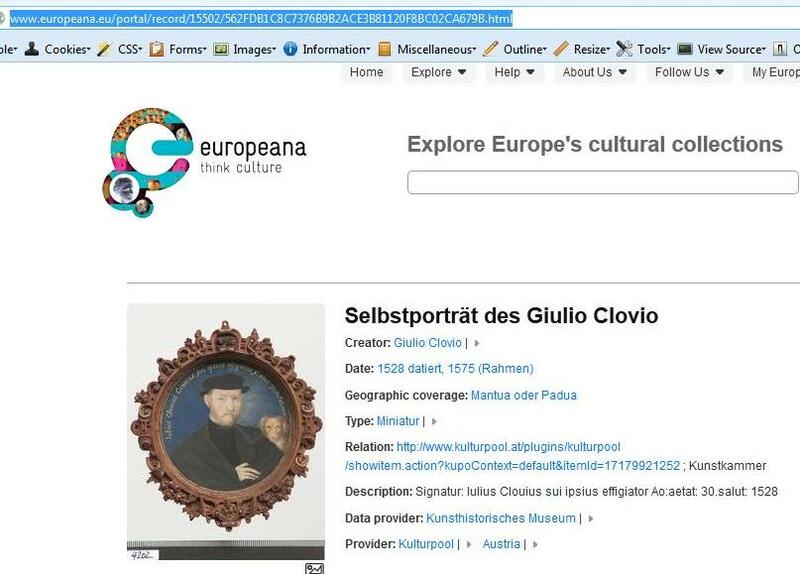 but at europeana.eu it is still not corrected (as of April 2014). 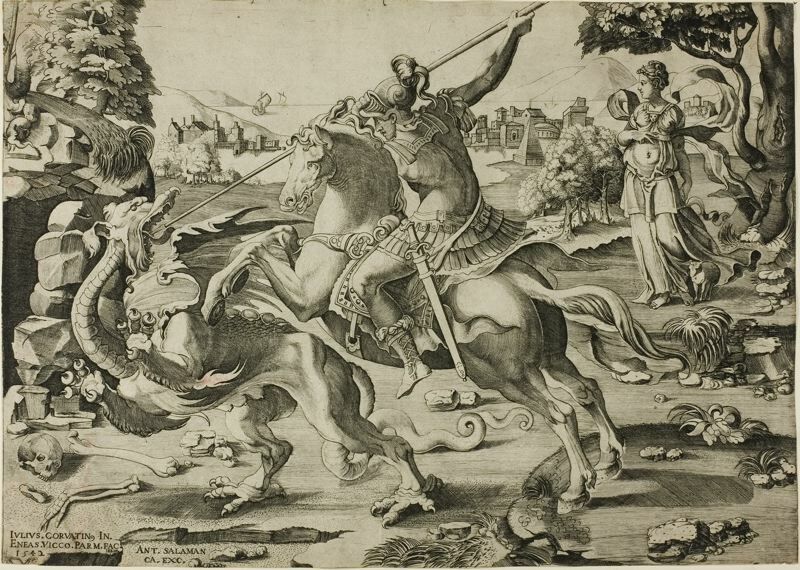 Inscribed at the bottom of a print made by Cornelis Cort, after Julije Klovic. In his works Julije Klović designated his origin as Croata, Croatus, Crovata, Coruato, Corvatinus, Illyricus. 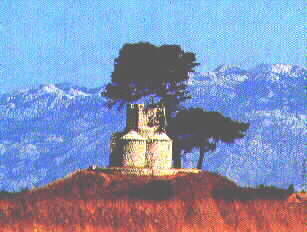 Iulius, Corvatin (that is, Iulius, the Croat), a masterpiece by Julije Klović created in 1542. He signed himself with his national name on the bottom left. Kept in the British Museum. Never has there been nor is there any likelihood that there shall be, for many hundreds of years, a more singular or more excellent illuminator, or we may say painter of small things, than don Giulio Clovio, his having proved to be far superior to all who have ever engaged in painting in this manner. German Ungar. 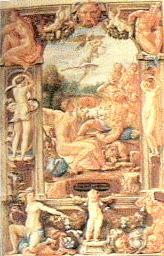 Bohemiae. Dalm. Croat. Rex. The city of Karlovac was built in 1579 as the first ideal Renaissance fortification in Europe (then followed Nove Zamky, Palmanova, Neu Breisach). It was bombed during the Greater Serbian aggression in 1991-95. Many beautiful Croatian Baroque paintings and illuminations can be seen on the walls of the churches in north-western Croatia (Lepoglava, Strigova, Varazdin), created by Ivan Ranger (1700-1754). On the photo: St. Luka (Strigova). One of the greatest Croatian Baroque painters was Tripo Kokolja (1661-1713), born in the town of Perast in Boka kotorska (since 1945 in Montenegro). Here we mention a French artist Charles François Beautemps-Beaupré, who prepared a superb collection of drawings of Croatian coast in his atlas entitled Reconnoissance hydrographique des ports du Royaume d´Italie situés sur les côtes du Golphe de Venise commencé en 1806 par ordre de sa majesté Napoleon. 1806. It contains 15 hand-drawn maps of various sizes, 2 sheets of coastal contours, water colour drawing. This unique Atlas, kept in the National and University Library in Zagreb, is according to presentation given by the British Library (follow the above link) of outstanding artistic and scientific value, and is a contribution to the scientific, cultural and historical accounts of the Croatian coast. Vjekoslav Karas (1821-1858): Roman Lady with a Lute, one of the most famous paintings of Croatian fine art from the middle of the 19th century... His parents are Bosnian Croats. Vlaho Bukovac (1855-1922); He worked in Paris from 1866-1893. In 1888 he visited England, made many friends and painted countless portraits of the members of various families, into which he was received as a friend and guest. His picture "Potiphar's Wife" was exhibited in the Royal Academy of London and in Birmingham. He was also a professor at the Academy of Art in Prague from 1903 to 1922. 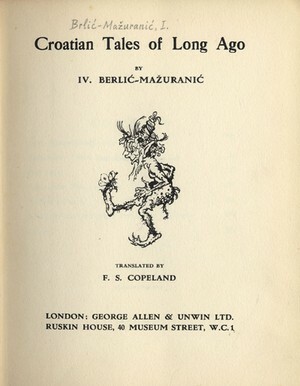 "History of the Croats'' (Povijest Hrvata, symbol of the University of Split), whose several copies are held in Croatia, while the original is in Belgrade (! ), capital of the new Yugoslavia. He planned it to be situated in the "Museum of Croatian Antiquities" in Split. One expects the Serbs to return this important monument to Croatia. 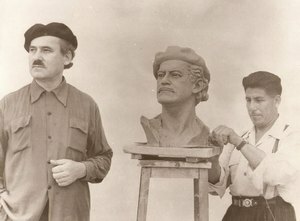 His sculptures can be seen in London (Tate Gallery), Florence (in "Uffizi"), Torino, Rome, Prague (in Hradcany), Budapest, Chicago (Chicago Indians, Grand Central Park, see a postcard on the right from 1939 and two photos below), South Bend (Indiana, USA), Rochester (Minnesota, USA), Baton Rouge (Louisiana, USA) etc. He also carved a monument of the most outstanding Slovak writer Martin Kukucin (Matej Bencur) in Punta Arens (Patagonia, Argentina). Matej Bencur spent a part of his life in Croatia on the island of Brac and wrote a book about the life of the Croatian emigrants in South America. 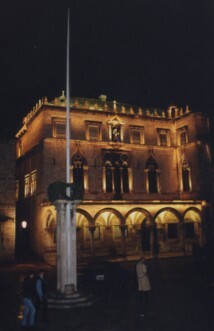 Mestrovic's 1939 sculpture representing Croatian ban and bishop Petar Berislavic (killed by the Turks in 1520) was exhibited on the central square of the city of Trogir. 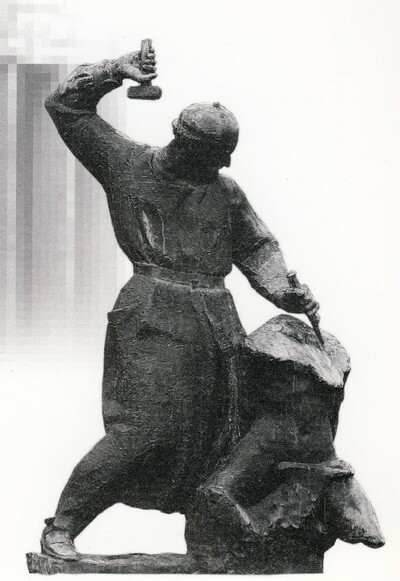 During the Italian Fascist rule the sculpture was destroyed. In 1970 a replica has been installed on the same place. Petar Berislavic was a close friend to a famous Croatian writer Marko Marulic, who described his tragic death. The grave of Mestrovic was desecrated by the Serbs in his birthplace Otavice during the 1991-1995 occupation of the Krajina region. Some of the original pieces of art from the Mestrovic Mausoleum were damaged, and some were stolen and transported to Belgrade. 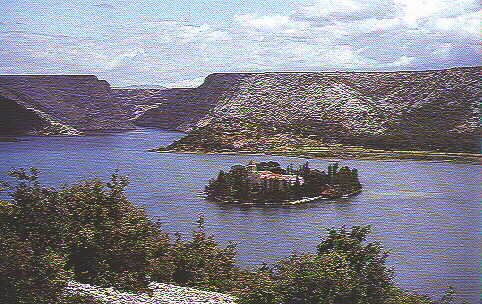 The remains of "The Monument of Gratitude to Motherland" can be seen in the beautiful Visovac Monastery on the river Krka. Photos from the booklet Spomen galerija Ivana Mestrovica, Vrpolje. 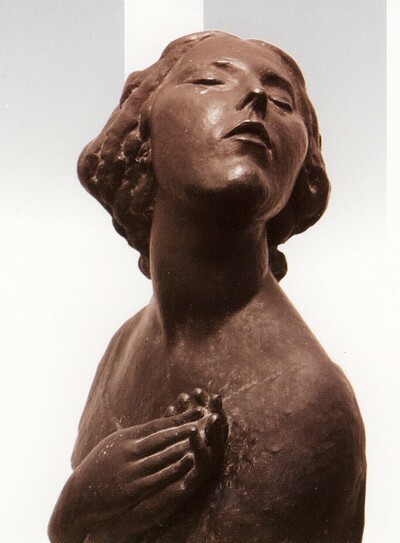 Mestrovic was born in Vrpolje on the north of Croatia in 1883, where he spent his first year of life. 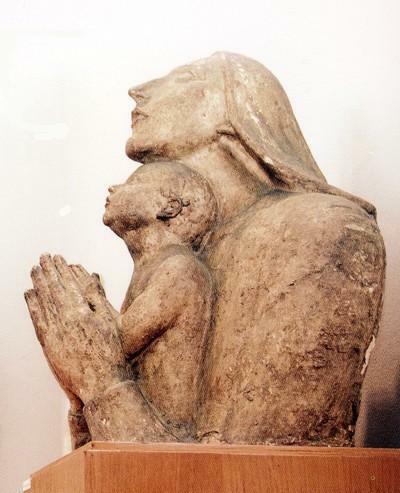 Ivan Mestrovic: ON RELIGIOUS ART (1954), excerpt: "...The head of that suffering Church is Cardinal Stepinac, my compatriot, my dear friend, of whom I and all Croats are proud. I am sure that our feelings are shared not only by all the Catholics throughout the world but also by all men of goodwill everywhere who cherish freedom of spirit..."
There are more and more people today who have come to the conviction that one of the main causes of the tragic events of the recent past, as well as those which loom on the horizon, is the fact that modern man has all but forgotten the great teachings of the Sermon on the Mount [The Bible, Mathew 5-7]. The blame for this rests not only on our contemporary despotism, but, unfortunately, on a long list of talented men of science and art who have not foreseen the corroding complications and destructive consequences of their doctrines. This atmosphere of unbelief, this tragic state of man cut off from the very axis which holds and moves everything, has had repercussions on all domains of human activity, including that of art, which in the most significant periods of civilization worked hand in hand with religion - an ennobling and spiritualizing factor in human life. Christian civilization, in our days, finds itself locked in a mortal struggle with the forces of secularism in varying forms and degrees. 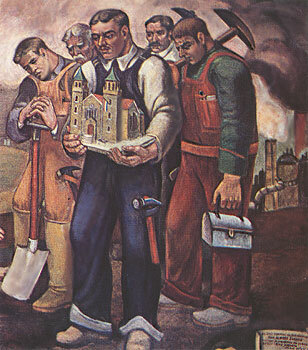 Many people fail to realize that Christianity, by waging the fight for its principles, defends also the foundation of the democratic way of life; for the concept of the dignity of each man and the equality of all men stands and falls with the Christian view that man is created in the image of God. Thus the Church is in the front lines of the battle against the onslaughts on human freedom. A moment ago, I mentioned my wood carving of the scene of the Crucifixion. The piece of wood on which I carved the Crucifixion has an interesting story which I would like to share with you. I was in Geneva, Switzerland, when I was seized by the desire to carve the Crucifixion. Every available oak had been bought by the factory that manufactured rifle buts, presumably for both warring sides. I had a hard time to acquire from the factory a few boards for relief. I was unable to get the whole piece of the trunk because they had all been sawed up. Finally, I discovered one trunk that had not been sawed off; it was withered and had stood with its roots in the soil and was not considered good for rifles because it was assumed that the wood was probably decayed. When I started to work on it, I discovered that it was solid and whole. The lumberman told me that it had been imported. I was surprised to learn that it had come from Croatia, my native country. In vain do the Godless and restless men, who are today making weapons in the hope of enslaving the world, think that the trunk of the Christian tree is withered. It will outlive and outlast the forces of evil in my native land and throughout the whole world. He who has conquered death will conquer the destruction of His teaching. 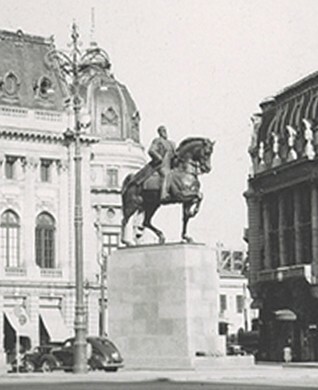 Mestrovic's equestrian statue of King Carol I of Romania in Bucharest was removed by the communist regime. One of Mestrovic's major works is Moses, the monument donated to the people of Israel. In 1928 Mestrovic sent four recommendation letters to his influential friends in Croatia in which he asked to help the Croatian Youth Society BUNJEVAC from the city of Subotica to visit the land of their grandparents - Dalmatia and Herzegovina. As he stated, Bunjevci Croats in Baccka have preserved the character of their grandparents in their ikavian speech and customs. 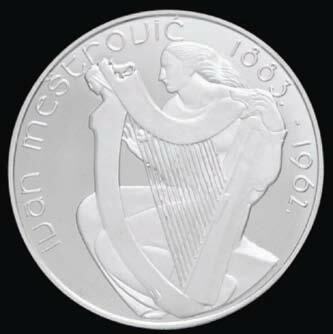 See "Marulic", 5/1998, 908-911. In 1954 Mestrovic became a citizen of the United States at a ceremony conducted by President Eisenhower at the White House. See his daughter's article. many embassies in Belgrade, Yugoslavia, still in use today, etc. 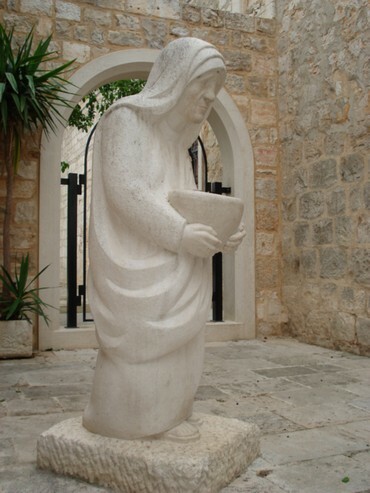 The first monument honouring Mother Teresa was carved in Supetar on the island of Brac (2002). It was unveiled by Martin Sheen. Jozo Kljaković (1889-1969) is distinguished Croatian painter and illustrator. 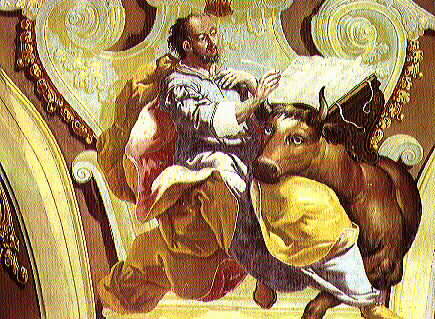 His paintings and murals are mainly of religious content. Kljaković is best known for his frescos that he painted in the church of St. Mark in Zagreb, in the parish churches of Vranjic (near the city of Split), in Dobrota (in Boka kotorska), and in the memorial church in Biskupija near the town of Knin, as well as for his mosaics in the Pontifical Croatian St. Jerome Institute in Rome. He left Croatia in 1943, and spent the following 25 years in Rome and Buenos Aires. It will be interesting for Russian readers to know that the earliest monument built in honour of the famous writer L.N. Tolstoy (1828-1910) was erected not in Yasnaya Polyana, but in Selca (1911, a year after his death), a small and lovely town on the island of Brac, which has a great tradition in stonemasonry. In the beautiful stone church in the town of Selca on Brac, there is Mestrovic's bronze statue of Jesus Christ, with a heart in his hand - symbol of love and peace. This statue, a gift of Ivan Mestrovic, was made from large amount of artillery shells left by German troops on Brac after the WW2. out of gratitude for his concern for the Croatian people. I like very much Gabrijel Jurkic (1886-1974), a little known Croatian painter from Bosnia - Herzegovina, who studied at the Academy of Arts in Vienna. 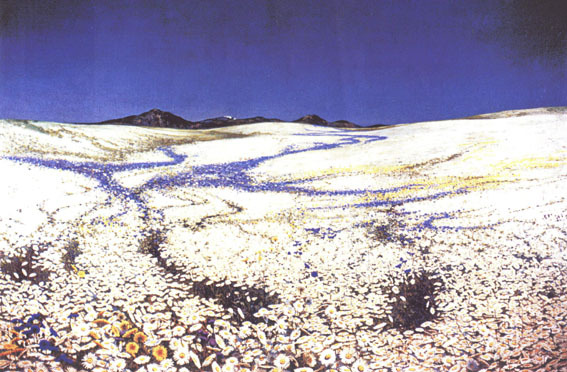 If you come to Sarajevo, don't miss to see his beautiful "Flower plateau" (from the Kupres area) painted in 1914, held in The Art Gallery of Bosnia - Herzegovina in Sarajevo. See on the left, and many more on Croats in Bosnia - Herzegovina. Biography of Gabrijel Jurkic (in Croatian). 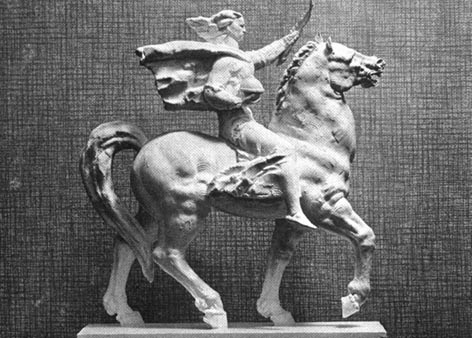 Vanka exhibited throughout Europe, and obtained many honours, among them Palme Academique of the French Legion of Honor. 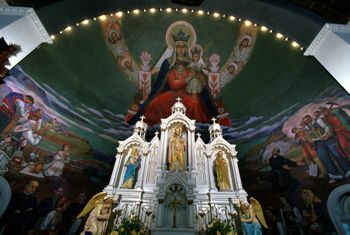 Having moved to the USA in 1934, he became noted for his beautiful church murals, for example in St. Nicholas Croatian Church, Pennsylvania. 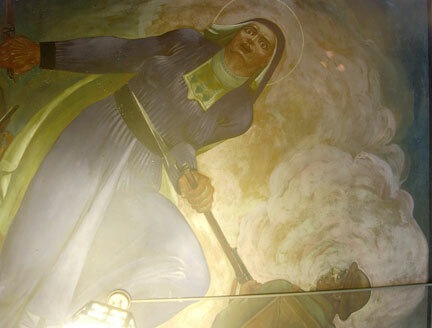 Some american specialists consider these murals the best church frescos in the USA. 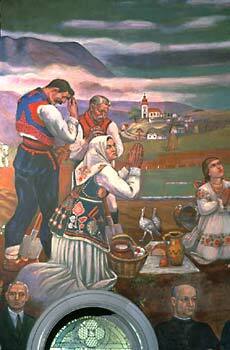 He depicts not only traditional Catholic scenes and symbols, but also the lives and spirituality of the Croatian immigrant community. Vanka founded the art department at Delaware Valley College of Science and Agriculture in New Britain, Pennsylvania. After his tragic death (drowned in the Pacific) a bird sanctuary was established in his honor at the Washington Crossing Nature Education Center. His main interests were in folklore and social motives, human destiny in general. 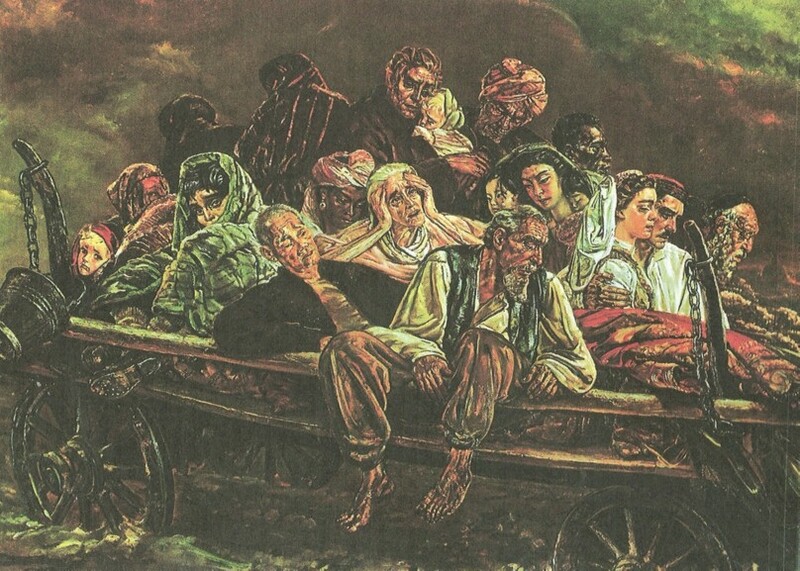 One of his deeply moving masterpieces is Lepers, a result of his short stay in India. 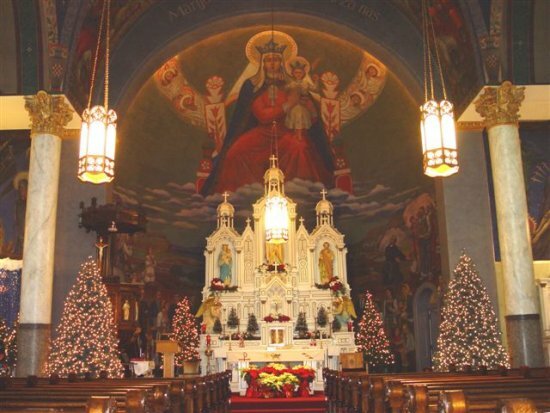 From Pitsburgh History (an excerpt): In Millvale, at St. Nicholas Croatian Catholic Church, one very unusual wall mural blends religious and political themes to express a strong personal message from its artist, Maxo Vanka, a Croatian artist who fled to the U.S. in the mid-1930's. 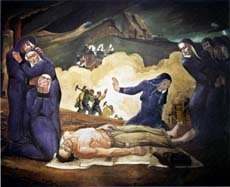 On the ceilings and walls of St. Nicholas, Vanka painted Jesus' mother weeping at the Crucifixion; a Croatian mother weeping as she raises her sons for war; an immigrant mother weeping as she raises her sons for hard labor in the manufactories; and the famous statue of Injustice wearing a gas mask. 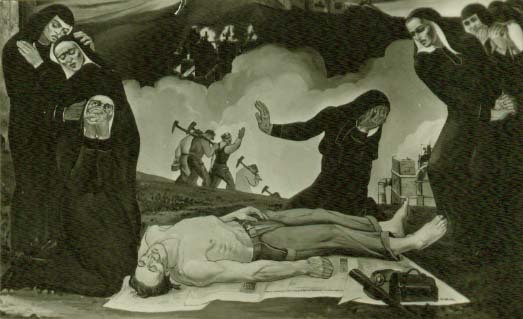 On the ceilings below the choir loft he painted images of war, mixing images of Christ with 20th Century soldiers, and at the back, a greedy capitalist sitting at a table ignoring a beggar at his feet. Mary, Queen of Croatians, pray for us! - Marijo, Kraljice Hrvata, moli za nas! The controversial commentary on social classes and injustice sparked debate at the time, and a prominent Pittsburgh family even offered one million dollars to the Diocese to whitewash what they felt was a personal attack. 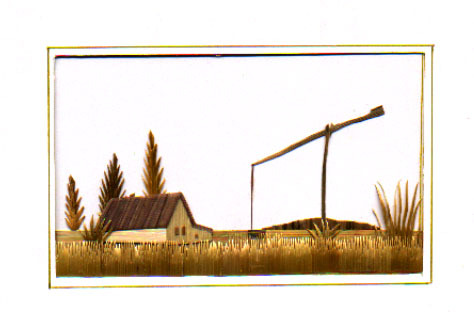 The offer was refused, and today the controversial images still exist along with Vanka's more pastoral images depicting rural life in a Croatian village. 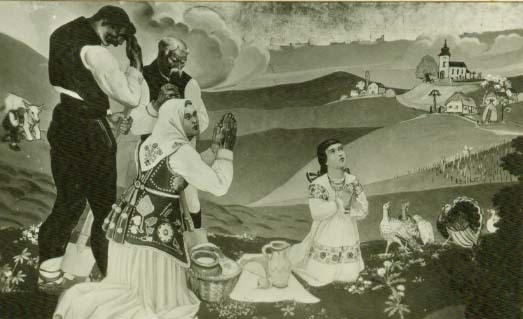 In those less provocative mural images, people are dressed in traditional Croatian costumes, and they dance by a sea that "flows" into the hills of Pittsburgh, surrounded by a painting of the parish priest and the immigrants who helped to build the church. Maxo Vanka told the story of Croatia's tragic heroes through war, and immigration, and work on the walls of St. Nicholas Croatian Catholic Church in Millvale. These murals are definitely not just for decoration like the murals in homes. What story do they tell? See here. 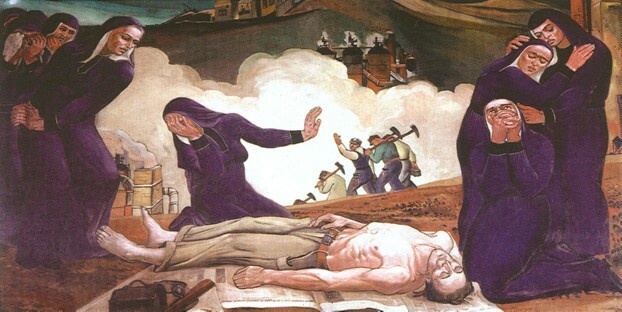 David Byrne (member of rock group "Talking Heads", New York): ...The church is Croatian and the murals, by Maxo Vanka, are spectacular -- the Diego Rivera of Pittsburgh, I would say. 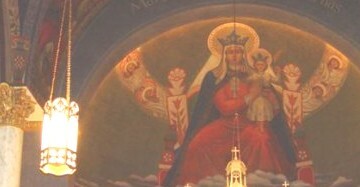 The murals were done during eight weeks in 1937, and they cover the interior of the church. 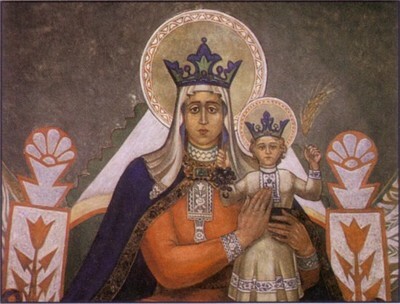 Of course there is the Virgin holding the child, but below her, for example, on each side of what is now the altar, are Croatian people, on the left from the Old World, and on the right from the New. A steel foundry can be seen belching smoke behind them. 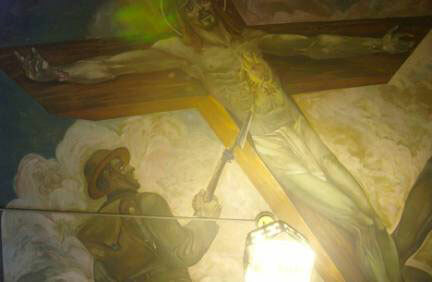 But more amazing are the political murals that echo the crucifixion. 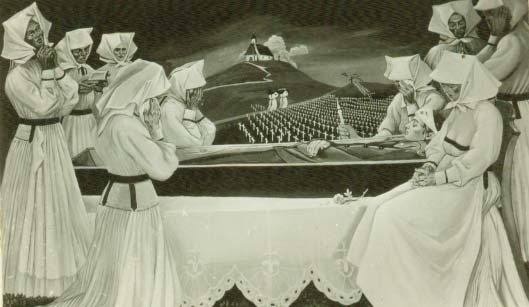 Widows mourn over a soldier in a coffin containing a bleeding corpse; crosses cover the hillside behind them. Another wall depicts a corrupt justice in a gas mask holding scales on which the gold outweighs the bread. Clearly World War II had a big effect on Maxo. 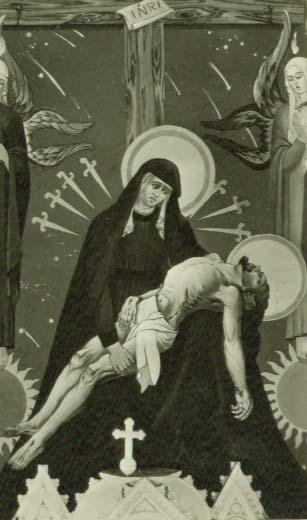 The Virgin, on the verge of being bayoneted herself, separates two soldiers. Maxo Vanka mural. Photo by David Byrne. On another mural an oligarch done as Death reads the stock reports while being served a chicken dinner by two black servants. One more: Jesus is stabbed, a second crucifixion. These are badly in need of renovation; probably years of coal dust have darkened them. But one can hope that these amazing things will survive and be cleaned soon. "The Croatian Mother Raises Her Son for War." "The Immigrant Mother Raises Her Son for Industry" by Maxo Vanka is based on a mining accident in Johnstown. The Murals at St. Nicholas Parish: ...Today they stand as a moving tribute to the people of Croatia, the Croatian immigrant and all immigrants to the United States. They are among the most striking and provocative murals found anywhere in the world. 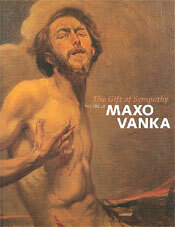 Maxo Vanka's twenty murals, combined with a more contemporary and complimentary mural by J I Knezevich, form a unique church artwork that combines secular and ecclesiastical images with startling interpretations of 20th century historic events. 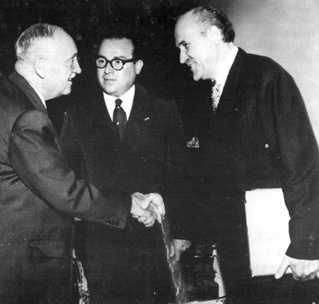 Maxo Vanka was a good friend to Andrija Stampar, a famous Croatian phisician, father of the World Health Organization (WHO). Dupor, M. Korčulanin Vanka, Zbornik otoka Korčule. Sv. 2(1972), str. 179-182. Laljak, S. Tajna slikara Maksa Josipa Vanke, Zaprešićki godišnjak 1997.: za grad Zaprešić i općine Brdovec, Bistra, Dubravica, Luka, Marija Gorica i Pušća, uredio Stjepan Laljak. Zaprešić: Matica Hrvatska Zaprešić, 1998. Str. 147-149. Maksimilijan Vanka. Katalog izložbe Maksimilijan Vanka, Galerija Klovićevi dvori, Zagreb 2002. 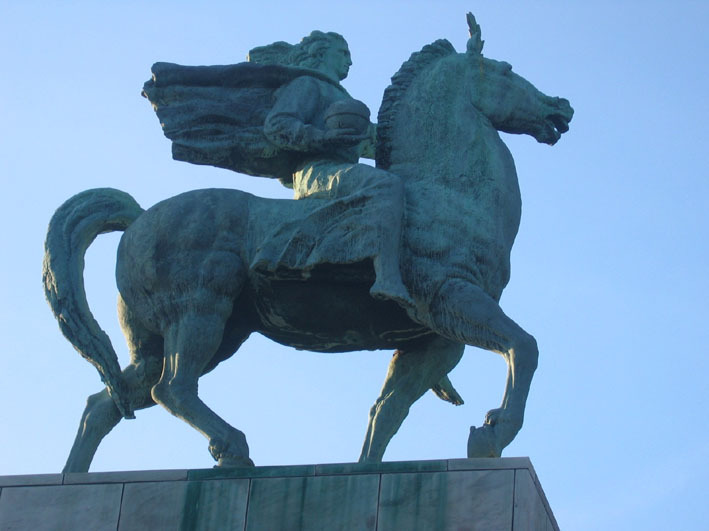 One of the symbols of the United Nations that everybody knows is the Horsewoman (the Monument of Peace), a sculpture created by Antun Augustincic (1900-1979). It was given as a gift to the UN and it is situated in front of the main building in New York. The basement of the monument is made of the marble from the Croatian island of Brac. The equestrian statue was cast in the city of Zagreb, capital of Croatia. 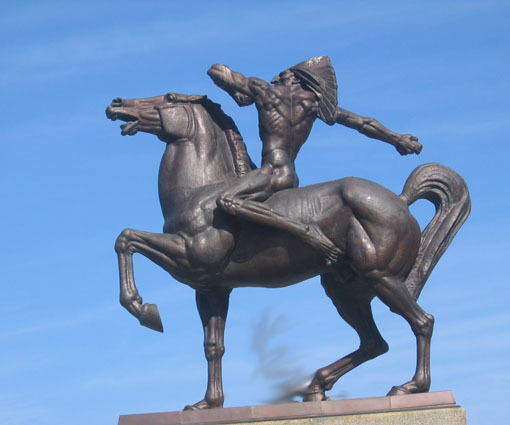 The Monument of Peace has 10 m high stand and 5.5 m high equestrian sculpture. 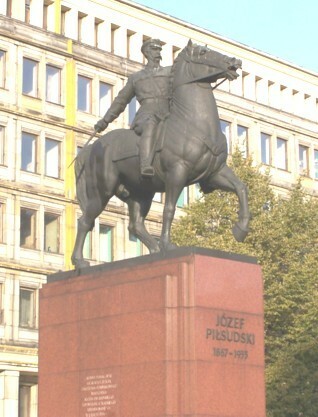 Another beautiful equestrian statue that Augustincic created represents a Polish marshal, Jozef Pilsudski. 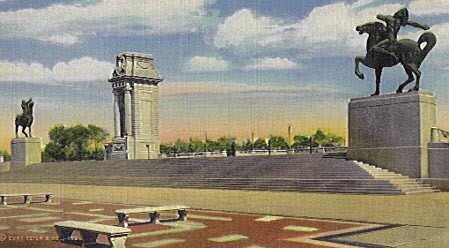 The monument was commissioned before WW II, and was supposed to be delivered in 1939. It was delivered only in mid 1990s, and is now in Katowice, Poland (many thanks to dr. Maciej Paluszynski, Wroclaw, for this information). 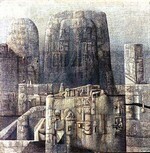 Augustincic studied in Zagreb and Paris, and except in these cities had exhibitions in London and Barcelona. He carved a bust of a famous Croatian violinist Zlatko Balokovic in 1967 (Zagreb, Mirogoj). The Charter of United Nations deals with human rights. Regarding basic human rights, we invite you to read a message of a Croatian Minister to those going to war from 1778, and due to its excellency translated into German, Dutch (in the Hague! ), Swedish in 1778, and into Latvian in 1804. 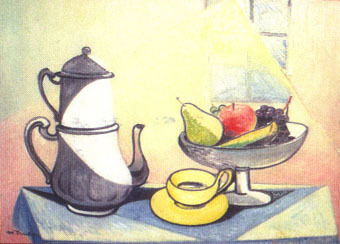 Zdenka Sertić (1899-1986), Croatian painter and ethnographer, collaborated in various journals, lexicons, and enciclopaedias as a graphic illustrator specilized in Croatian folklore, in particular in national comstumes and customs. She had exhibitions in Paris, Leipzig, Barcelona, Berlin, Haag, Bruxelles, Kopenhagen, etc. 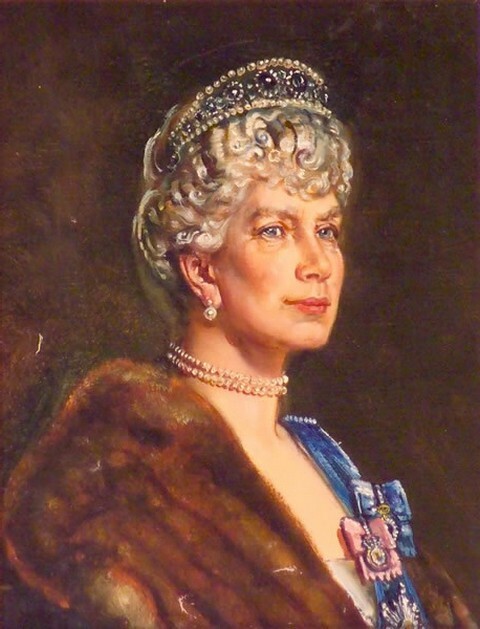 the English Queen Mary (Queen Mother, in 1938, upon her request; detail from the portrait; the portrait is kept in the Buckingham palace in London, see [Sabater, p. 19]: "...Como expresión de su trabajo en esta época, basta citar el famosos retrato que hizo de la Reina María de Inglaterra, retrato que adorna una de las estancias del Palacio Real de Buckingham." the royal family of Sweden (King Gustav V upon his invitation to Stockholm in 1948, when he was at the age of 90). Palma de Mallorca (Casa de Cultura, 1961), etc. In the course of Krekovic's first exhibition in the USA (held in New York) he was described as "Yugoslav painter". Krekovic did not permit such misrepresentation, and warned the organizers that he would not allow the exhibition to go on if he were not described as Croatian-peruvian painter. He succeeded, despite the protests from the embassy of ex-Yugoslavia. It is not surprising that he is often described as Croatian born Peruvian artist, or as Poeta de la pintura. Krekovic signed himself as pintor croata or pintor croata-peruano. His grand exhibition of ethnographic paintings held in 1954 in Lima, was opened by the president of the state. In 1966 the famous Peruvian city of Cuzco (or Cusco), the old capital of The Inca Empire and "The archaeological capital of South America", conceded him honorary citizenship and the Gold medal of the city. ...magnifico museo y magnifico pintor. 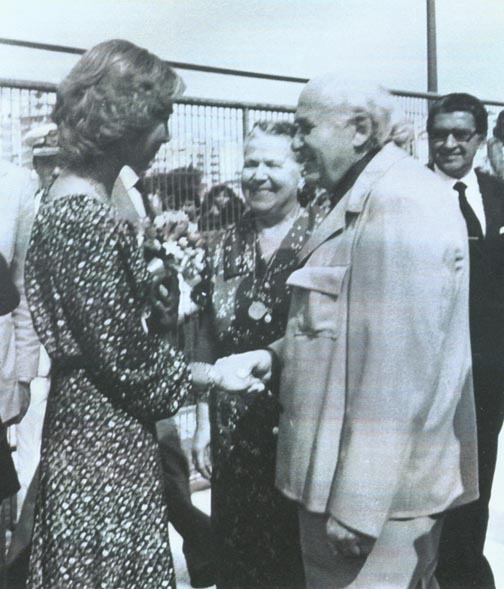 The Spanish Queen is also the honorary president of Krekovic's gallery. 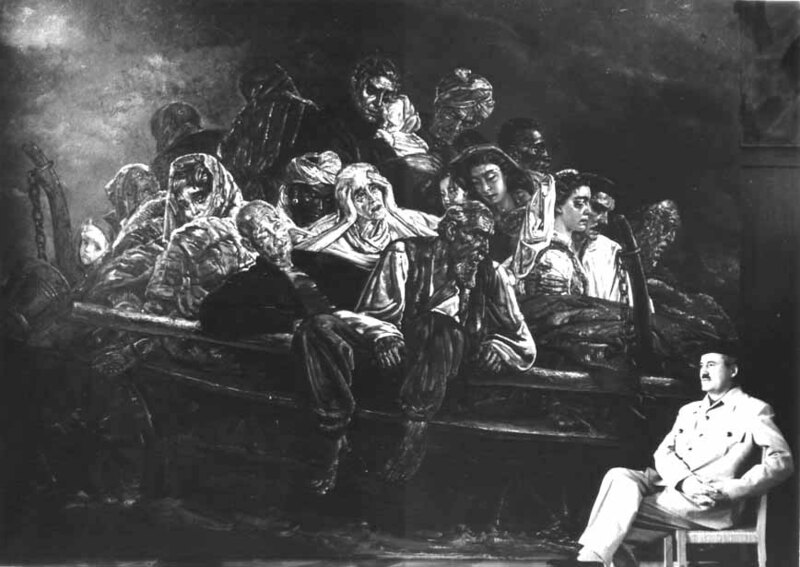 The following fascinating work is entitled Exodus of the 20th century. 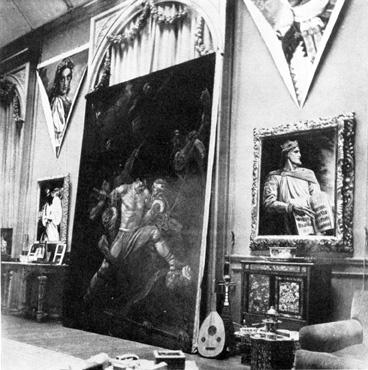 Note that all races are represented, with a couple in Croatian national costumes on the right (in fact his auto portrait and portrait of his wife Sina). Also, the far right person represents a Jew with a typical Jewish cap. El sentimiento de Kristian Krekovic hacia el mundo es único. Impregna todo su arte e impregna con extraordinario creatividad y constructivo carácter. 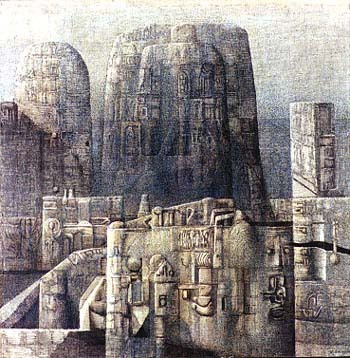 Kristian Krekovic, the Croatian-born artist, has dedicated his life and his Art to the fabulous Empire of Incas, Pre-Incas and present day Hispano-American Folklore, with such prodigality of love and truth, art and knowledge, force and sensuality, sacrifice and perseverance, the likes of which have never been equaled by any other painter in the artistic history of America. Over the long years when I had the honor of directing and guiding the culture of my country, I have been able to observe the superhuman efforts made by Krekoviæ who visited museums all over the world to study the New World archaic cultures and to paint in their collections the precious textiles, pre-Columbian jewels and adornments for his paintings. I was also an exceptional witness to his expeditions in the native regions of the Andes to heights around 10.000-12.000 feet [3-4.000 meters], in order to seek out and paint the purest and most representative types of the Aboriginal race, there on the spot. The splendid Krekovic collections enjoys its great prestige because it is the only in the world which presents the Art and Culture of the South American Indian that legendary bronze race of the Incas, with such astonishing and brilliant results, excellence in picturing, strongest historical and scientific authenticity, creative imagination and magnificent interpretation. The whole undertaken and realized by one single man. This explains the enormous success, endorsed by the critics, which his exhibitions have enjoyed in the most important cultural centres of Europe and U.S.A.
Krekovic's paintings are such expressive compositions, and almost three dimensional. His brush-strokes are definitive, his colouring luminous. He cannot be classed among any existing Schools, he is quite unique and apart. His Peruvian work has no equivalent, and occupies a special place, not only in the artistic history of Peru, but in the Art of all time. Nobody can visit his collection without being profoundly impressed by it. For his artistic merits the Peruvian Government has granted Mr. Krekovic the "Order of Merit for distinguished Services" and furthermore the President of the Republic of Peru has patronised his exhibitions all over world, a most exceptional distinction. BARCELONA; "La Vnaguardia Espanola": Juan Coretés, 1957. "...as sensational, without any exaggeration, can be qualified the exhibition brought to us by the Croatian-born Peruvian artist Kristian Krekovic. His, for the most part monumental paintings are masterly and complicated composition, with absolutely perfect drawing, masterly treatment of chiaroscuro and brilliant and luminous palette...". The above two texts are taken from the prospect Krekovic Collection, Palma de Mallorca (many thanks to Mr. Vladimir Novak for this and related materials). 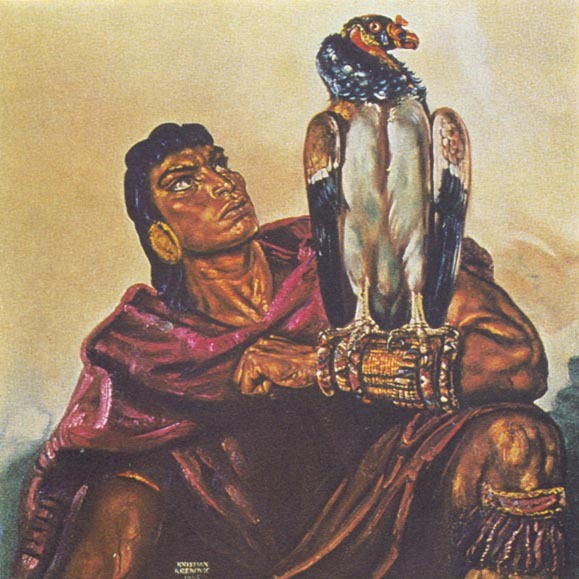 Es uno de los más grandes pintores de todos los tiempos. Krekovic used Croatian Glagolitic script in daily correspondence with his friend Marko Dosen (president of Croatian Parliament during the WWII period), as was the custom also in his family during his childhood. His wife was Sina, a Frenchwoman who mastered Croatian language perfectly, using many Croatian expressions and words already expelled during the Yugoslav period. Born in Paris in 1910, daughter of outstanding surgeon, she spoke also Quechua, Catalonian, Spanish, Italian, German (studied piano at the Vienna Conservatory), French, Russian, and English. Krekovic dreamed about free Croatia, and to start again working on his Croatian cycle, but he died too early. It is worth mentioning that in 2002 Javier Bizarro Bentitz won the prestigious "Premio de Poesia Antonio Machado" with his poem Los fantasmas del Parque Kristian Krekovic, among 154 other works. We mention the monograph Kristian Krekovic. El artista y su obra (1997) written by Gaspar Sabater and published in Spain. The Master thesis (Mémoire de Maitrise) under the title Kristian Krekovic was defended by Ingeborg Möller Rizo at Universidad Cluny Espana (CLUNY ISEIT) in 1974., based on personal interviews with Sina Krekovic, wife of Kristian Krekovic. His works of art have been bought in 1950's by three prestigious american institutions for their collections: Philadelphia Museum, Siracuse Museum of Fine Arts, and Museum of the American Indians in New York. Espacio dedicado exclusivamente a la exposición de la obra del artista croata Kristian Krekovic, instalado en Mallorca desde 1965 hasta su muerte en 1985. Presenta además algunas piezas de artesanía popular de Perú, país donde también residió el pintor. "Poeta de la pintura" llamó a Eulogio Díaz del Corral el pintor croata Kristian Krekovic. de.wikipedia.org provides disgraceful misrepresentations about Kristian Krekovic. Oscar Nemon (1906-1985), outstanding sculptor and medallist, was born in Croatian town Osijek, and has Jewish roots (Oscar Neumann). Having obtained his baccalaureate in Osijek, in 1923 he moved to Vienna. 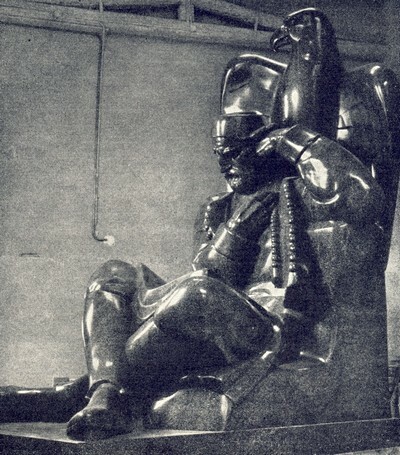 He was inspired and supported by Ivan Mestrovic, a great Croatian sculptor. 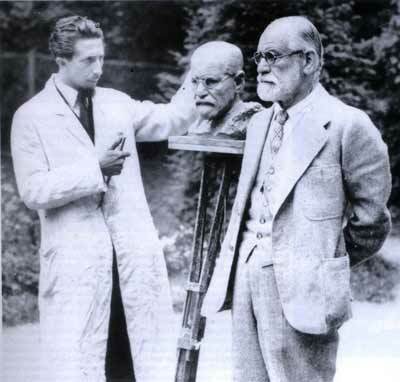 In 1931 Nemon made a portrait of Sigmund Freud in person, for which Freud said to be "...a very good and astonishingly lifelike impression of me". After a short stay in Paris, having obtained bursary from his native city of Osijek, he went to Brussels in 1925, to study at the Academie des Beaux Arts. He stayed in touch with Osijek, and made for the city the monument "June Victims", commemorating the murder three Croatian members in the ex-Yugoslav Parliamnet in Belgrade in 1928, among them Stjepan Radic. In Burssels he made busts of King Albert I, Queen Astrid, and Auguste Vermeylen, a notable historian of the Flemish School of Painting. In 1938, due to the Nazi invasion of Belgium, he fled to England, and lived in Oxford. During the WWII a larger part of his family perished in the Holocaust, including his mother and brother. 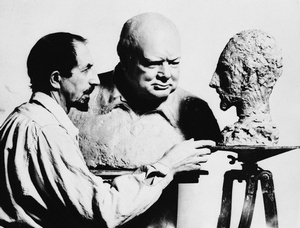 In subsequent years he made sculptures of many distinguished persons, like Winston Churchil (in 1965, upon the invitation of the British Government, and on the occasion of his death), Queen Elizabeth II, Queen Mother (upon her request), Dwight Eisenhower, Harry Truman, Viscount Montgomery (of Alamein), Harold Macmillan, Margaret Thatcher, etc. 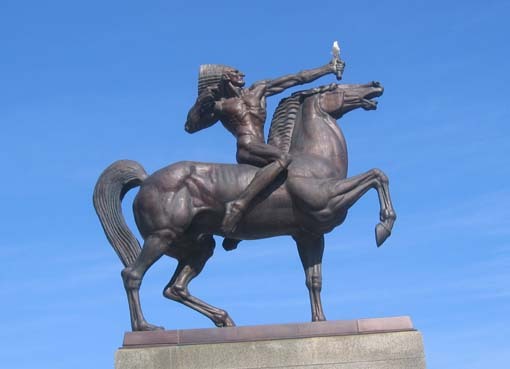 It is interesting that Winston Churchil in return made his amateur sculpture of Oscar Nemon. 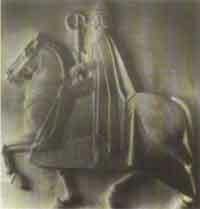 In 1981 he made a bronze relief for Canterbury Cathedral. His last major work was a National Air Force Memorial for the city of Toronto, Canada, unveiled by The Queen in Toronto in 1984. For his exceptional achievements the University of St. Andrews in 1977 conferred Oscar Nemon an Honorary Doctorate of Letters. On the occasion of his death, a memorial retrospective exhibition of his works was organized in 1985 in Croatia, in his native city of Osijek. Oscar Nemon's sculpture of Churchill and Churchill's sculpture of Nemon. They sculptured each other simultaneously. Some web pages wrongly indicate that Nemon was born in (ex) Yugoslavia, which at that time did not exist. Nemon was born in Croatia, then a constituent of Austria-Hungary. 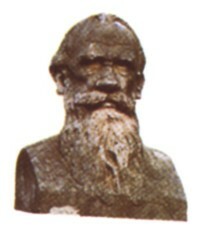 Dalibor Prancevic: Zanemareni kipar Oscar Nemon, [PDF] (Neglected sculptor Oscar Nemon, in Croatian), Kvartal II - 4, Zagreb, 2005., pp 10-14. 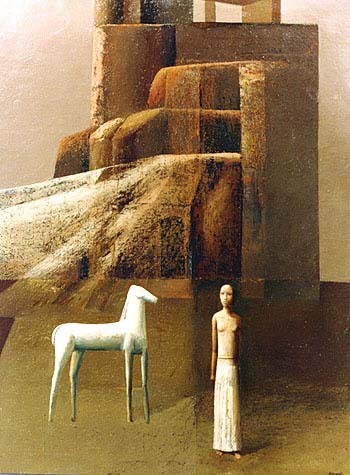 Oton Gliha (1914-1999) depicted through his paintings his poetic impressions about hundreds of kilometers of dry stone walls called GROMACE, built on numerous Croatian islands during many centuries. His very original style, based on the unique texture of the gromace, attracted considerable interest during exhibitions in Venice (the bienalle), Sao Paulo, Torino, Milano, Genova, Paris. Some of his paintings are held in the Tate Gallery, the Guggenheim Museum, also in Sarajevo, Ohrid, and in the building of YU government in Belgrade. The solemn curtain of the National Theatre Ivan Zajc in the city of Rijeka is based on the gromace landscape, which is very typical for the nearby largest Croatian island of Krk. Gliha's art reveals an intimate relation between gromace and the structure of the Croatian Glagolitic Script. Virgilije Nevjestic is one of today's greatest graphic artists, a professor in Paris (since 1977 at the ``Institute for the formation of restorers of works of art'', and also the chief of the ``Atelier for artistic technology''). His masterpieces are in possession o many private collections, including a collection of Georges Pompidou, a former president of France. One of his famous large-scale paintings is Vukovar, which he described as a scream, revolt against an evil done to the Croatian people. 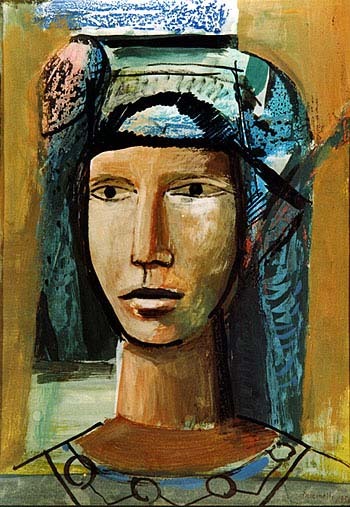 Zdravko Ducmelic (1923-1989), outstanding Croatian artist born in Vinkovci, studied painting in Zagreb, Rome and Madrid (Real Academia de San Fernando), and in 1949 emigrated to Argentina. From 1963 to 1966 he was director of Escuela Superior de Artes de la Universidad Nacional de Cuyo. 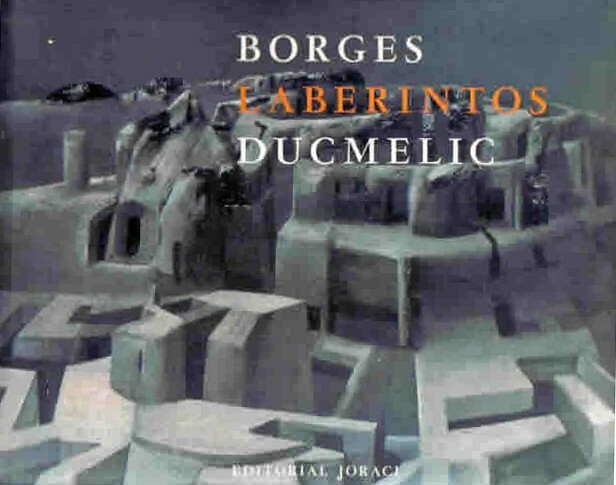 Ducmelic masterfully illustrated a famous book "Laberintos", written by Jorge Luis Borges (Ed. De Arte Gaglianone, Buenos Aires, 1983), with his surreal, quasi-metaphysical works (...el pintor preferido de Borges). 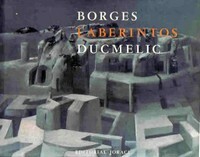 He also made various portraites of Borges that were exhibited in 1987. In 1980 Ducmelic has been invited by Argentienan Ministry of Foreign Affairs (Ministerio de Relaciones Exteriores) to realize expositions of his works in several museums in Japan: in Tokio, Kyoto, Aomori and Kamatura. He also had exhibitions in Panama, Peru (Lima), Chile (Santiago), Mexico, Cuba (Habana), Canada (Ottawa) and China (Bejing). In 1983 he had exhibitions in his homeland, in Zagreb and Rijeka. For more information see El Golem and Arroyo. An interview with Ducmelic in Croatian has been published in Hrvatska revija: Razgovor sa Z. Ducmelicem. Hrvatska revija. 38 (1988) 4. - 651-668. 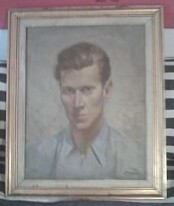 One of his works of art has been bought by H. Kissinger (Hrvatska revija. 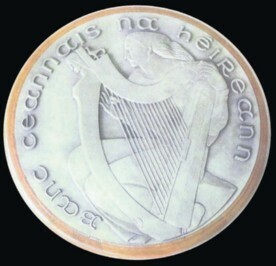 32 (1982) 1, p. 129.). Josip Turkalj (or Joseph Turkaly, 1924-2007) sculptured numerous works that are found throughout America in private collections and public places. Suffice to mention a few: an eighteen-foot bronze Moses on the campus of Notre Dame, two marble statues of Mary (Our Lady of Peace and Our Lady of Bistrica) at the National Shrine in Washington, D.C., a bronze statue of George Washington in the city of Buffalo, also the statues of St. Paul (Croatian church in Cleveland), Cardinal Stepinac (Croatian Home, East Lake, Ohio), St. Francis' Stigmata (Windsor, Ontario), Immigrant Mother (Toronto, Buenos Aires, Zagreb), etc. His works are also found in: Worthington and Duluth, Minnesota; Gary, Indiana; Dubuque, Iowa; Rochester, New York; Villa Maria, Pennsylvania; Detroit, Michigan; St. Thomas, Ontario, and many other public places. (This is an excerpt from an article by Dr. Ante Cuvalo, USA). See www.turkalyart.com. Dusan Dzamonja (1928) is an avant-garde sculptor whose monuments can be seen, besides Croatia and Bosnia-Herzegovina, also in public areas in Austria, Switzerland, Belgium, France, the Netherlands, Italy, the USA, and in the new Yugoslavia. As a means of expression he uses iron, glass, concrete etc. 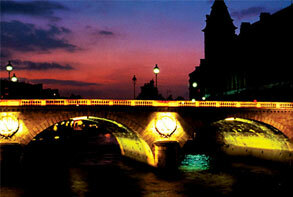 In 1998 he had a great retrospective in Paris (Place Vendome). Zvonimir Mihanovic, born in 1946 near Split, achieved worldwide fame for his poetic paintings of peace and tranquility along Croatian coast, drawn with breathtaking precision. In 1978 he was awarded the grand prize of the prestigious Salon d'Automne in Paris. 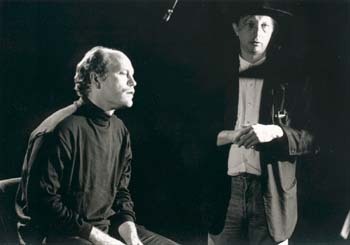 In 1996 his work was exhibited in the Croatian Pavillion at the Atlanta Summer Olympics. Dimitrije Popovic held three exhibitions in Rome as a part of Vatican's celebration of Grand Jubilee to mark 2000 years of Christianity. These exhibitions are also part of the project "The Way and the Holy Land (Rome - Jerusalem)". 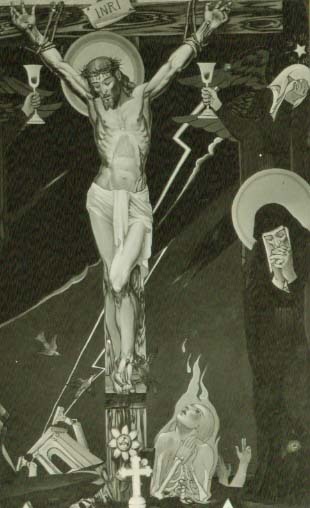 Paintings within Popovic's cycle Corpus Mysticum are devoted to Jesus Christ and his crucifixion. Born in Montenegro (1951), he graduated at the Academy in Zagreb. 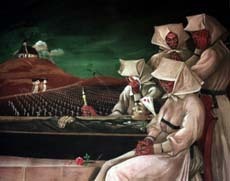 In 1982 he exhibited in Pforzheim with Salvador Dali. Ante Dabro, born in Croatia in 1938, began carving as a shepherd. His talent was first noticed during his childhood, when he carved a dove so precisely, that his cat jumped on it. He studied under Antun Augustincic in Zagreb. Not agreeing with communist Yugoslavia, since 1967 he lives in Australia, where he became one of the most outstanding sculptors. He exhibited in many european cities, and his work is especially esteemed in London. Some of his most important works include Royal Australian Navy Memorial (see also here and here; opened by Queen Elisabeth II in 1986, placed near the Australian Parliament in Canberra), La Perouse memorial in Paris (built in honour of an 18th century French explorer and naval officer Jean-François de Galoup, Comte de La Pérouse; ordered by the French Ministry of foreign affairs, placed about 200 meters from the Eifel tower). In 1999 the ANU (Australian National University in Canberra) Drill Hall Gallery held a major survey exhibition of his work, celebrating 30 years of his activity in Australia. In his short biography presented at the School of Arts of the Australian National University, where he lectures, we can read the following: While he supports contemporary changes in art, Ante remains a passionate guardian of traditional artistic conventions. 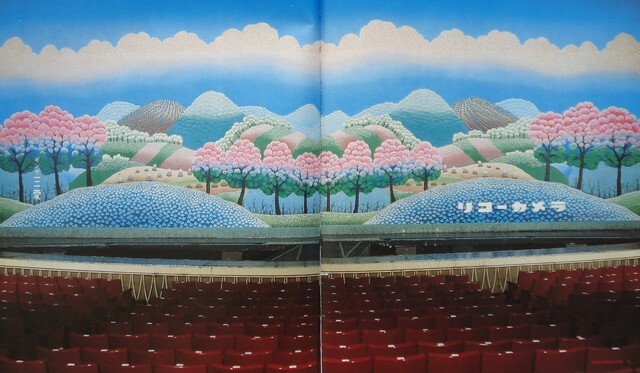 Ivan Rabuzin (1921-2008) - designed a curtain decorating the stage of one of the best Kyoto theaters (Japan), as well as the Takarazuka Theatre in Tokyo (10.5 x 24 m, 1980), and several other museums in Japan: Sategaya Art Museum in Tokyo, Saitama Museum of Modern Art in Urawa, Isetan. A detial from Ivan Rabuzin's drop curtain in Takarazuka Theatre in Tokyo. Photos from Croatia, homeland of Marco Polo, Croatian national tourist board, 2008. 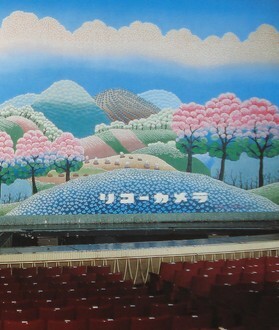 The above mentioned ceremonial drop curtain at the Takarazuka theatre in Tokyo was produced by the Heizo Tatsamura Institute, Textiles Arts Kyoto, in 1979 and 1980. Twenty four weavers were working for three months to make it. Among other materials, 30 kg of gold thread was used. M. Shiro produced a film about Rabuzin's ceremonial drop curtain. This information is from Croatia, homeland of Marco Polo, Croatian national tourist board, 2008. He also had exhibitions at Daimaru and Shinsabashi in Osaka. 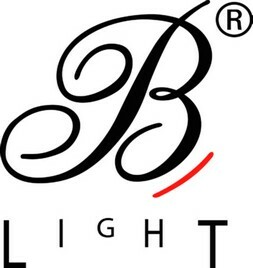 Since 1976 his designs are used by "Rosenthal", renowned producer of porcelain ware. He is also a member of the Croatian Parliament (Sabor). It is interesting that Rabuzin's father was a miner, while his mother was blind. His art was exhibited throughout the world: Zagreb, Paris, Antibes, Zurich, Milano, USA (Louisiana, Smithsonian Institution, Carnegie Institute Museum of Art, Scottsdale Center for the Arts, Milwaukee Museum Art Center, Chicago Public Library, C.W. Post Art Galery/Long Island University, Pittsburgh), Oslo, Munich, Dusseldorf, Amsterdam, Verona, Brescia, Florence, Tokyo, Osaka, Geneva, Cologne, London, etc. As many as 10 films have been made about Rabuzin's work, including one in Japan (Moritani Shiro, Kyoto). Among 13 monographs devoted to his work we mention only the following one: Masayoshi Honme, Ivan Rabuzin / Taiji Harada, 1990, published by Kodanasha, Japan. Very interesting are are naive artists called slamarke from Tavankut (and also in Subotica) among Bunjevci Croats in Backa on the north of today's Yugoslavia. The name slamarke is derived from Croatian name for slama = straw. They use straw weaving for beautiful and poetic description of their life on salas, a small oasis with a hut on immense panonian golden plain full of cereals, with several trees and unavoidable djeram - an old type of well (see on the right). A very common motive are small Catholic churches and Christian symbols. I adore this type of art. At the 1976 international exhibition of naive art in Moscow Ana Milodanovic won the gold medal with her work with straw weaving. Also, Kata Rogic had exceptional honour to present her work to Pope Paul the VIth. the Art Pavilion in Zagreb. 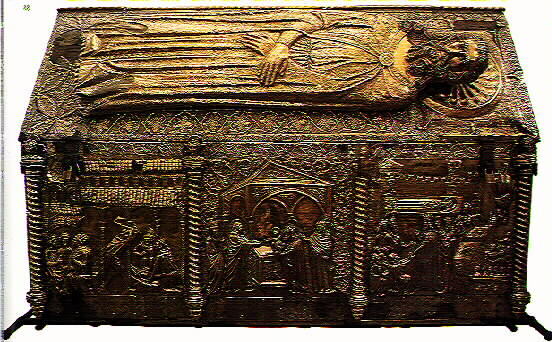 Here you can see a reliquary chest of St Simun, created by the goldsmith Francis of Milan in 1377-1380, made on order of Elizabeta, daughter of Bosnian Viceroy (ban) Stjepan Kotromanic and the wife of Croatian-Hungarian King Louis Anjou. It contains 200 kg of silver and 50 kg of gold, and is held in the church of St Simun in Zadar. No doubt, the most interesting gallery in Zadar is the Benedictine Gallery of Gold and Silver, which contains numerous artifacts from 11th century onward, all of them created in this ancient town. It is indeed amazing that the artifacts have been saved during the ferocious bombing of the Allies in 1943/44, when the city, a jewel of Croatian history and culture, was 90% destroyed for the reasons that we still do not know. The Benedictine convent of St Mary, where the Gallery is situated, founded in 1066 during the reign of the Croatian King Kresimir IV (i.e. in time of William the Conqueror), has been active without interruption till these days! 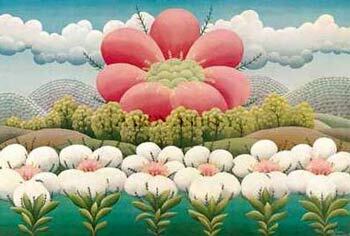 For additional information about Croatian art in Zadar see here. 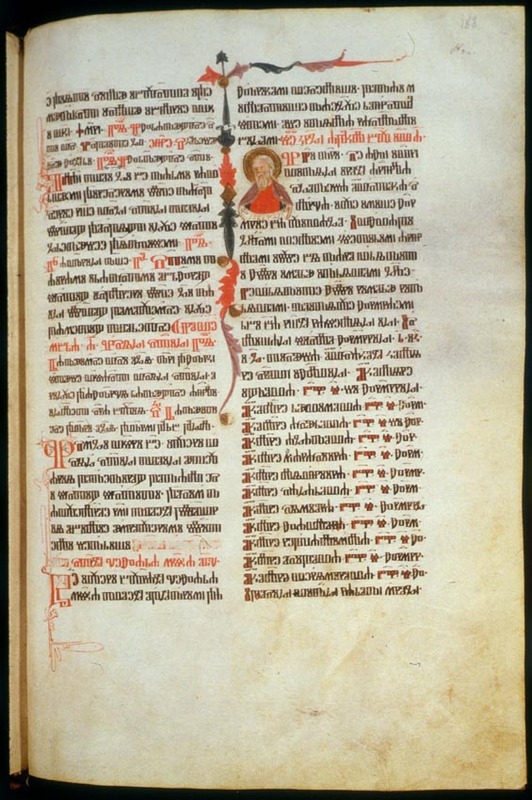 Some Croatian cities in Dalmatia have been described by William Wey, a teacher at Eton, during his pilgrimage to the Holy Land in the 15th century. 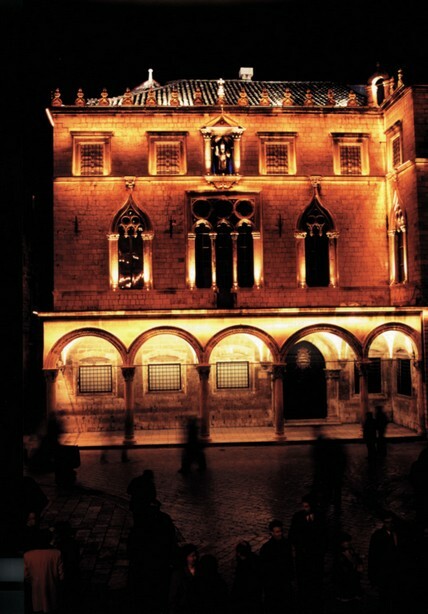 He was impressed by Dubrovnik, Rovinj, and, especially, by Zadar where "lies the entire body of St Simon who, in the temple of Jerusalem, carried Christ in his arms". The Mestrovic gallery in Split is also famous. The Gallery of Vukovar, a donation of Antun Bauer, was very rich. The Eltz Palace, museum with artifacts of the famous Vucedol Neolitic culture. Twenty trucks were brought from Belgrade to Vukovar in December 1991 to plunder the City Museum in Vukovar, as well as the Gallery and the City Library, under the auspices of Belgrade curators. The Vukovar Gallery was left completely empty. One expects the Serbs to return 1648 stolen works of art of outstanding Croatian artists, that belonged and still belong to the Gallery of Vukovar. This is only a part of the overall number of about 10,000 stolen works of art from several Vukovar museums and galleries that are now held in Belgrade and Novi Sad. Till now not a single work of art has been returned. (Personal information by dr Bauer, on this web with his kind permission.) ... 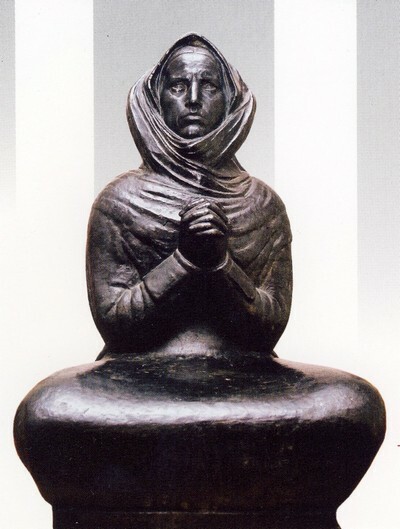 The above mentioned stolen works of art were returned to Vukovar only in 2002, in such a shape that it will require a lots of further financial and other effort from Croatia to restore it, since it was held in inappropriate conditions in the new Yugoslavia during more than ten years. We know that a part of this very important Croatian cultural heritage has already been sold in Western Europe. We also know of unsuccessful attempt of Belgrade cultural representatives to exhibit in France this stolen Croatian cultural heritage as Serbian. Aleksandar Antoljevic Zvjagin, outstanding Russian painter living in Croatia, created beautiful masterpieces for Croatian churches and convents both in Croatia and in Bosnia-Herzegovina. See for example his St Francis taming a wolf, kept in front of the famous Franciscan monastery on the islet of Kosljun near the town of Punat on the island of Krk. One of the most beautiful buildings in Croatia is the fortress of Veliki Tabor from 15th century, in the north of Croatia (in the region of Hrvatsko Zagorje). An interesting Croatian Jesuit and missionary to India, Nikola Ratkaj (Rattkay) (1601 - 1662), was born there. Another Jesuit and missionary to Mexico born in Veliki Tabor was Ivan Ratkaj (1647 - 1683). For more information see [Croatian "Indias"] and [Zoric]. Veliki Tabor contains a part of collection of Antun Bauer, famous Croatian art collector from Vukovar. These works of art were collected in 1990s, after the Greater Serbian robbery of the Vukovar Gallery and the Vukovar City Museum in 1991. Veliki Tabor had a very rich collection of arms, which was stolen in 1920s and 1930s, during the first Yugoslavia, and transferred to Belgrade. This important Croatian historical heritage is held in the Military museum of Belgrade (Kalemegdan). Veliki Tabor has been saved by a group of enthusiasts gathered around prof. Josip Stimac, dragon of Tabor Grad, by the end of 1980s. During the Yugoslav communist rule after 1945, this Croatian monument of zero category has been left without any care. Unfortunately, numerous important fortresses castles and parks throughout Croatia were ruined during the ex-Yugoslav period. Castles and parks in Eastern Slavonia (in Croatian). Archeological museum in Zagreb contains many important finds related to the territory of Croatia and neighbouring areas. It also possesses the most extensive known text written in the Etruscan script (15 m long), still not deciphered. Extremely important is The Museum of Croatian National Monuments in Split, containing many finds related to the Croatian Pre-Romanesque art, mostly from the region of Knin (Biskupija, Crkvina - remains of a church where King Zvonimir was allegedly crowned, 11th century). The museum was first founded by don Lujo Marun in Knin by the end of the 19th century. In 1934, due to far-sightedness of Stjepan Gunjaca, outstanding archeologist, it was moved to its present site. A good illustration of the intensity of the cultural life in Croatia in the 19th century is the following: just in the period from 1868 to 1883 the Croatian Theater in Zagreb had as many as 140 (hundred and forty!) premières of the pieces written by French authors, with approximately the same pace until the end of the century. Similarly in Dubrovnik, Zadar and Split, see [Croatie/France], p. 233. The grand Croatian National Theater in Zagreb was opened in 1895. The Croatian National Theater ``Ivan pl. Zajc'' in Rijeka is still older - built in 1885. 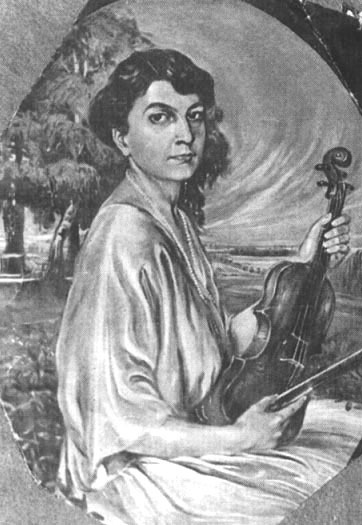 Sarah Bernardt visited Zagreb twice, in 1889 and in 1904, with La Tosca and La dame aux camélias, performed of course in French. Also according to [Dolbeau] she had several visits to Zagreb. Is it true that Émil Zola had Croatian roots, as claimed by the French intellectual Cristophe Dolbeau, see p 47 (Colich -> Zola)? 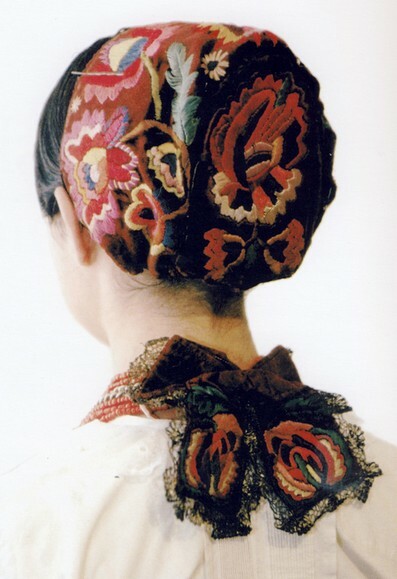 The French writer George Sand wrote her novel "Uscoque" (Uskok) in 1838, Prosper Merimée wrote his famous "Guzla" in 1827, both obviously inspired by Dalmatia and its inhabitants. The French writers were extremely popular in Croatia in the 19th century. French universities allocated about 600 scholarships to ex-YU students each year between the two WWs. Here the Croatian students were represented with only by 5, i.e. with less than 1% (one percent). Despite this, in the same period more than 100 French authors were translated into Croatian by Zabavna biblioteka led by Nikola Andric in Zagreb. See [Gregory Peroche], p. 210. In Zagreb alone, in the period from 1919 to 1980, there were near two thousand performances of Shakespeare's dramas (exactly 1940 performances: Hamlet, 654; Twelfth night, 252, A Midsummer Night's Dream, 189; Othello, 132 etc.). They were put on in Zagreb already in the 19th century. Zagreb also hosted the great Shakespeare interpreter Laurence Olivier, with the guest performance of Titus Andronicus by the London Old Vic (1934). You can see the home page of the Blind Theater Company - "NEW LIFE" (NOVI ZIVOT) founded in 1948, and until 1986 the only blind theater company in Europe, when several new Blind Theaters appeared. That is why Zagreb will have the honour to organize The first European festival of Blind Theaters in 1999. The King of Dolls! - Since 1991 an invaluable collection of more than 350 dolls owned by Mr Ljeposlav Perinic, Argentina, is in Zagreb, Croatian capital. Dressed in picturesque national costumes from over 100 countries, these dolls represent gifts of many statesmen to Mr Perinic. He collected them for more than 30 years. Zagreb geborene und seit Jahrzehnten in Deutschland lebende Multikünstler galt als "Anarchist der Fantasie". Radikal und konsequent hatte er sich zeitlebens allem Kommerziellen widersetzt und bewusst gegen den Strom gesteuert. Mit Filmen wie "Der Damm" oder "Der Brief" hatte Kristl großen Anteil am "Neuen deutschen Film". An der Kinokasse erwiesen sich Kristls Leinwandexperimente, bei denen die Einstellungen ohne jeden Bezug zueinander gedreht wurden und Beziehungen erst durch den Schnitt und die Montage zu Stande kamen, als wenig erfolgreich. Auch in späteren Werken wie "Film oder Macht" und "Obrigkeitsfilm" stand Kristls Kino für Subversion und gegen alle historischen Konventionen der Filmerzählung. The first film was shot in Zagreb in 1912. 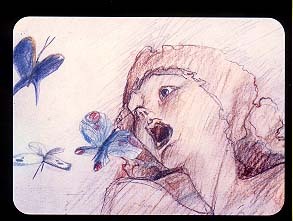 Many interesting animated movies were created by the Zagreb School of Animated Film. a film which opened new directions in the history of world animation. 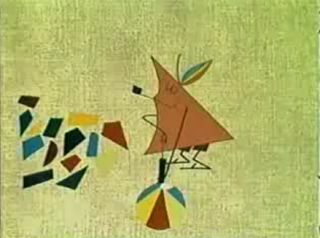 "Surogat" (Substitute, The Ersatz) by Dusan Vukotic (1927-1998) was the first animated film created outside the USA which won the prestigious OSCAR award (1962). Since 1972 Zagreb has been biennially a host to the World Festival of Animated Film. 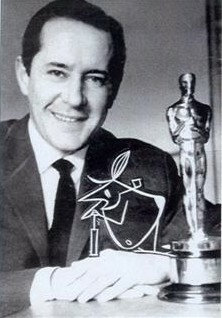 Zdenko Gasparovic from the town of Samobor near Zagreb is the author of a fascinating cartoon movie "Satiemania", which won Grand Prix on the World Festival held in Zagreb in 1978. It represents a beautiful, poetic study of human steps accompanied by the music of Eric Satie. Very popular Croatian cartoon character in numerous European countries is Professor Balthasar, particularly in Scandinavia. In Denmark, for example, some computer companies are named after Professor Baltazar. See The History of Croatian animation by Borivoj Dovnikovic. Professor Balthasar has been created by Zlatko Grgic, a Zagreb Film author. See also here. Listen to the Professor Balthazar Theme Song. The Little Flying Bears (Les Oursons Volants) were also created by the Zagreb School of Animation (Zagreb Film), in co production with Ciné-Groupe (Canada), also very successful throughout the world. It is little known that Walt Disney bought land for his future Disneyland in California from a Croatian proprietor. I owe this information to the King of Dolls, whose relative was married to this Croat. The first public park in Europe was opened in Zagreb already in 1794 by Bishop Maksimilijan Vrhovec. Named "Maksimir" to his honour, it has a nice ZOO, lakes and pavilions. 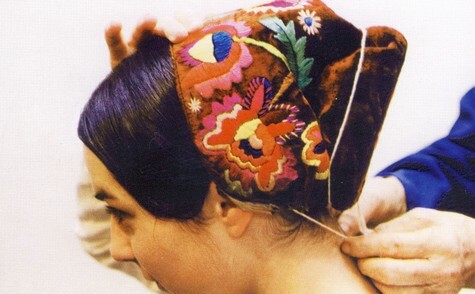 One of the distinguishing traits of Croatian national art can be seen in the famous PAG LACE. 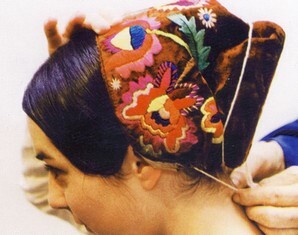 Meticulous and painstaking work of sunburn women from the island of Pag has been highly praised by European aristocracy. 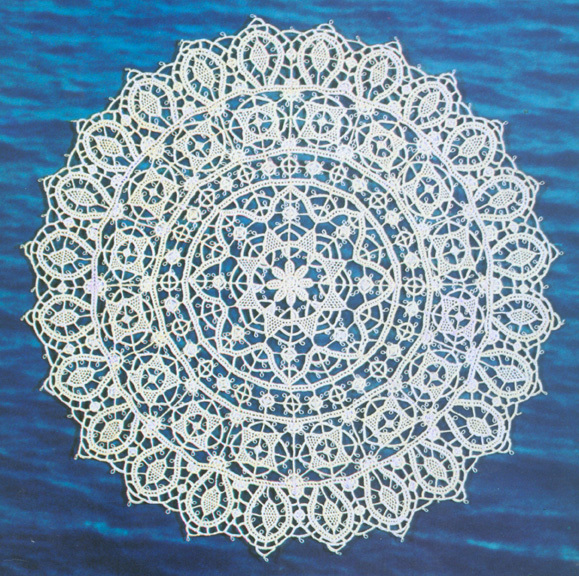 Maria Theresia (1717-1780), Austrian Empress, visited the island of Pag solely to get acquainted with lace-makers and their art. Afterwards, she invited three of them to be permanently on her court in Vienna. Some of the oldest Croatian laces, dating from 16th century, can be seen in the Benedictine convent of St. Mary in Zadar. 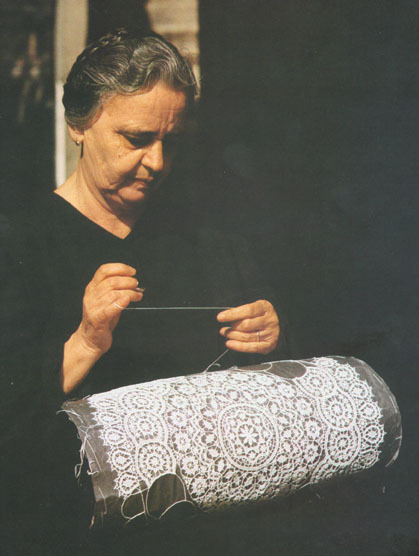 The island of Hvar also has the tradition of making lace, but from the threads of agave leaves. Nuns from the Benedictine monastery in Hvar are masters of this unique craft. 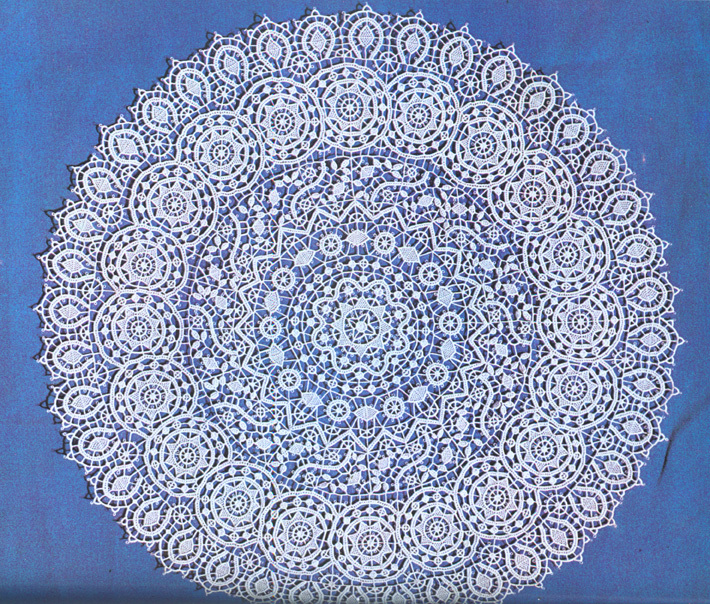 The town of Lepoglava (north of Zagreb) is also known for its tradition in lace production. 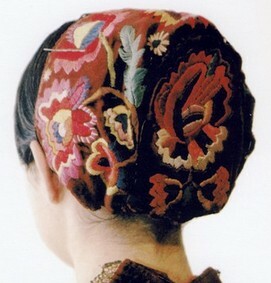 Croatian cap from Pokupsko (a small town on Kupa river, south of Zagreb). Reproduced from [Pokupsko], many thanks to Mr. Bozidar Skrinjaric for permission. 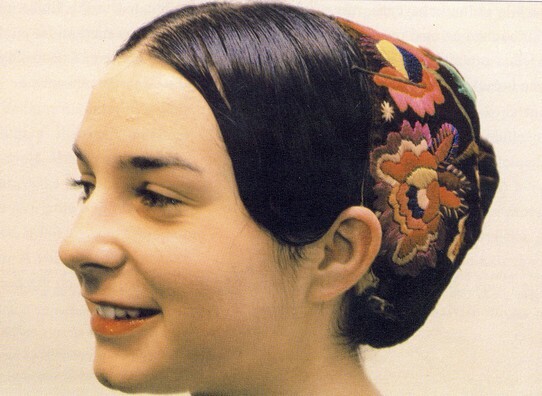 Croatian national costumes constitute a tremendous subject. See some of them. Henryk Sienkiewicz (1846-1916), Polish Nobel-Prize winner, wrote parts of his renowned novels during five of his visits to Croatia. Though Janko Polic Kamov (1886-1910) died very young, at the age of 24, he was a distinguished representative of Croatian and European avant-garde literature. This little known and very original writer was discovered more than 70 years after his premature death. His short story Sorrow was published in the Boston literary journal "Partisan Review." Some distinguished American literary theorists consider him the greatest literary discovery of the 1990s in America. Polic-Kamov's short story Freedom was published in the New York magazine "Grand Street" in 1996, and in the same year he was included in the book History of the Hispanic Avant-garde and the literary journal Corner, published in Oakland, California. By the end of 1990s several Kamov's unknown manuscripts have been discovered in Barcelona, Catalonia (Spain), where he died. His short stories have been published in 100,000 copies. See an article An introduction to the Croatian Avant-Garde Writer Janko Polic Kamov at the USA www-journal "Corner" devoted to the avant-garde, written by Mladen Urem, Rijeka, Croatia. It is little known that Isadora Duncan (american dancer) and Charlie Chaplin visited Croatia in 1921. They stayed in a villa near Jastrebarsko, on the nice Pljesevica hill. Their signatures are in a guest-book. Rabindranath Tagore, a famous India's poet, visited Croatia (Zagreb) in 1926. John Malkovich, a famous American actor, has Croatian roots. It is interesting that he recited verses of Croatian national anthem Lijepa Nasa (Our Beautiful) in Nenad Bach's song "Can We Go Higher?" in 1990s, see the video via www.lijepanasadomovina.com. Many thanks to Nenad Bach for this information. The unique beauty of Croatian landscape is offered by the magnificent mountain of Velebit, and the famous Primosten vineyards, where folk builders used dry stone walls to protect every handful of soil from being washed away from the arid rocky terrain. Thus an amazing rocky lace of Primosten has been obtain over the centuries, whose large sized photo can be seen inside the building of United Nations in New York. It is not surprising that Velebit's Endemic Garden and Vineyard from Primosten have won the gold medal at Japan Flora 2000 international exhibition of garden arrangements. The exhibition in 2000 was held on Awaji islands near Kyoto, with participation of 60 countries. The largest cathedral in Croatia is in the town of Djakovo, bearing visible scars of the 1991-1995 Greater Serbian aggression on Croatia. 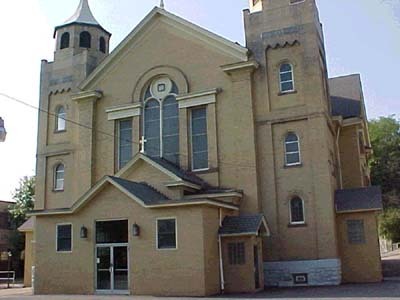 The church of Sv. Kuzma and Damjan in Vukovar, the second largest in Croatia, was seriously damaged during Yugoslav bombing and shelling in 1991, and devastated in the period of Greater Serbian occupation in 1991-1995. The Zagreb Cathedral is the third largest church in Croatia. The earliest urbanist in the modern sense was Pope Sixto V (he was the Pope from 1585 to 1590), who had a Croatian father (born in Boka, in today's Montenegro) and an Italian mother. Hermann Bollé (1845 - 1926), born in Köln, Germany, constructed (or participated in construction of) about 140 buildings in Croatia. Some of the most important are the Zagreb cemetery (one of the most beautiful in Europe), Museum of Arts and Crafts in Zagreb, the Zagreb cathedral, Djakovo cathedral, palace of Croatian Academy of Sciences and Arts. Nenad Paulic, Ivo Majorinc - the bank and hotel Marriot, Prague. Nikola Basic, Croatian architect, designed Sea Organ (Morske orgulje) in 2005 and Monument to the Sun (Spomenik suncu) in 2006 in the city of Zadar. In 2006 he received the European Prize for Urban Public Space for his project of the Sea Organ. Charles Billich is outstanding Croatian painter born in 1934 in the town of Lovran in Istria, and since 1956 working in Australia. He has permanent exhibition of his works at Hakane Museum in Tokyo since 1997, and was designated the official artist of the Australian Olympic team for Olympic Games in Sydney in 2000. I like his Canberra cantata. In 1998 Charles Billich completed his series of Bleiburg paintings. 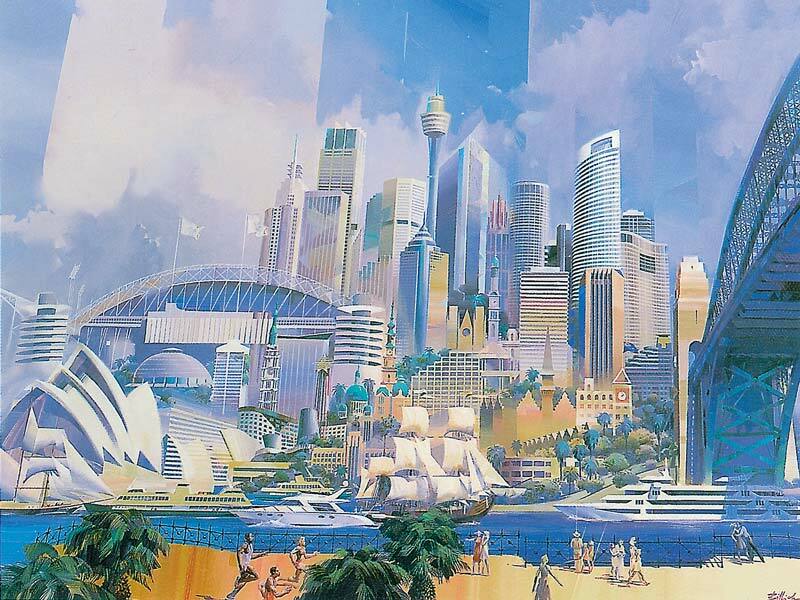 He was elected the official painter of Australian and the USA national teams at Olympic Games in Greece, 2004. 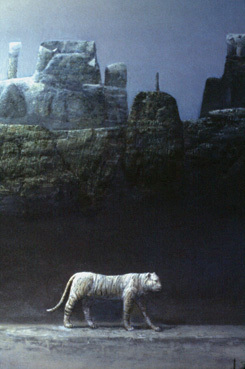 In 2004 he was elected the Official Artiest of the 2008 Beijing Olympiad. Laureate of the Milan & Spoleto Award, Italy, in 1989. His most famous galleries are Billich Gallery in Sydney (100 George Street), Australia, and Fortezza Gallery in the lovely town of Lovran, Croatia. In 2004 he had the exhibition of some of important Croatian contributions to science, held in the building of United Nations in New York (portraits of Faust Vrancic, David Schwartz, Lupis Vukic, Slavoljub Penkala, Josip Vucetic, Nikola Tesla, Marin Getaldic, Rudjer Boskovic, Marco Polo, Andrija Mohorovicic, Spiridion Brusina, Lavoslav Ruzicka, also Croatian cravate, and an oil representing one of truly painful Croatian themes from the period 1945-1948 immediately after the WW2: Bleiburg). He was commisioned to paint East Timor's official independence painting. 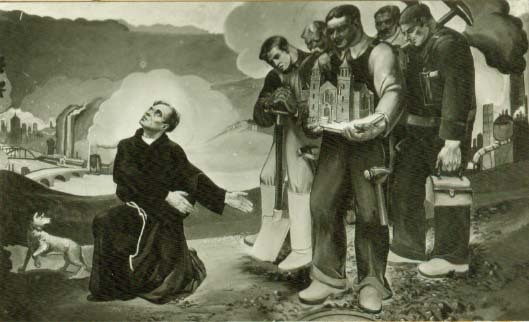 He presented a painting to pope John Paul II. Velimir Trnski, top Croatian painter, "paid tribute to Katarina Zrinski née Frankopan (17th century), the young widow of Petar Zrinski, but seen, and painted, from a (post)modern sensibility angle" (Darko Glavan, art historian). Davor Vrankic, distinguished Croatian painter living and working in Paris and New York, uses the motives of interlace patterns from the north of Croatia (more precisely, from his native Slavonia) in his extremely complex and intricate artistic compositions. See Ice Dreams for more details. 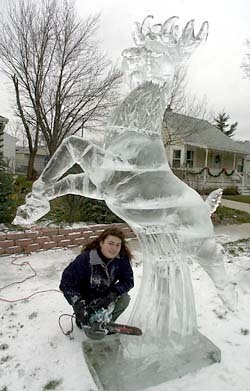 Please, note that this art has a very demanding sporting elements: sculptures are made at temperatures reaching -30 degrees Celsius, and it is quite nontrivial to manipulate with a huge block of ice weighing several hundred kilograms. For more information see also The CROWN. 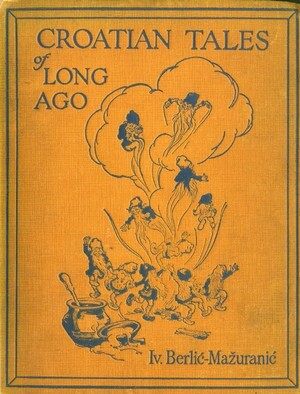 and published in 1924. in London by George Alen & Unwin Ltd (260 pp, hardcover). These stories have become popular worldwide due to recent fantastic flash-art presentations, initiated by Helena Bulaja, Zagreb. See for example Neva, music and animation by Ed Beals. ... Une des toutes dernieres productions originales de Croatia Film, "Lapitch - Le petit cordonnier", tiré d'un conte de Ivana Brlic Mazuranic, femme écrivain croate du XIXe siecle, est actuellement le produit phare de l'école : avec plus de 300 000 cassettes vidéos vendues rien qu'en France, commercialisées par TF1 Vidéo, il représente la production audiovisuelle croate la plus recherchée sur marché international. (source: Ambassade de Croatie en France). Croatia and Europe, in five monumental volumes. See Jacques Le Goff's foreword to its second volume (French edition). at Zeljko Skropanic web site.